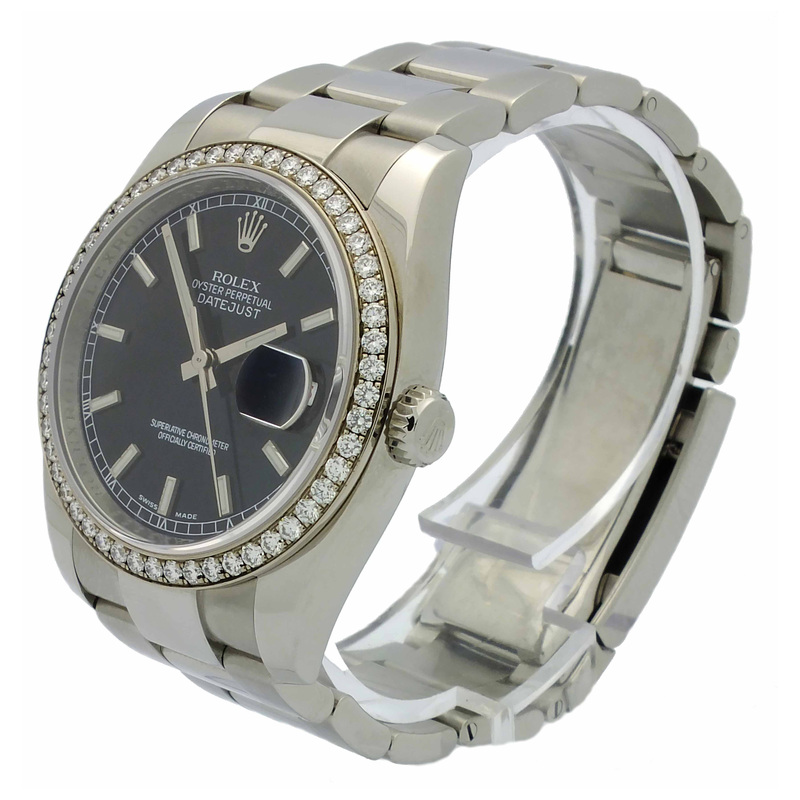 Stainless steel Rolex Oyster Perpetual Datejust with factory diamond bezel. 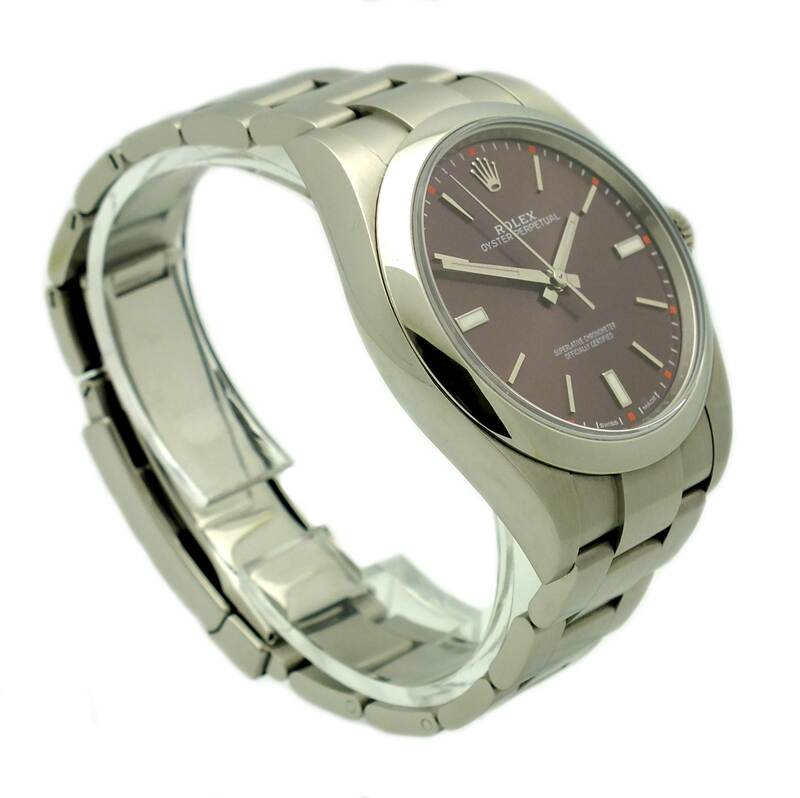 Stainless steel oyster band. Black dial with stick hour markers. 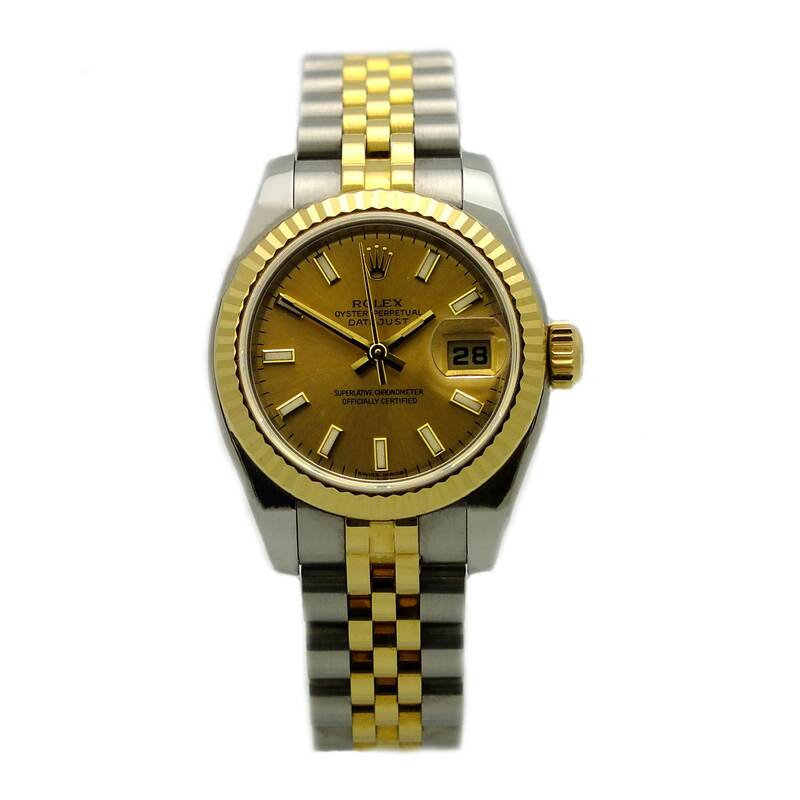 Rolex Datejust in stainless steel and 18kt yellow gold. 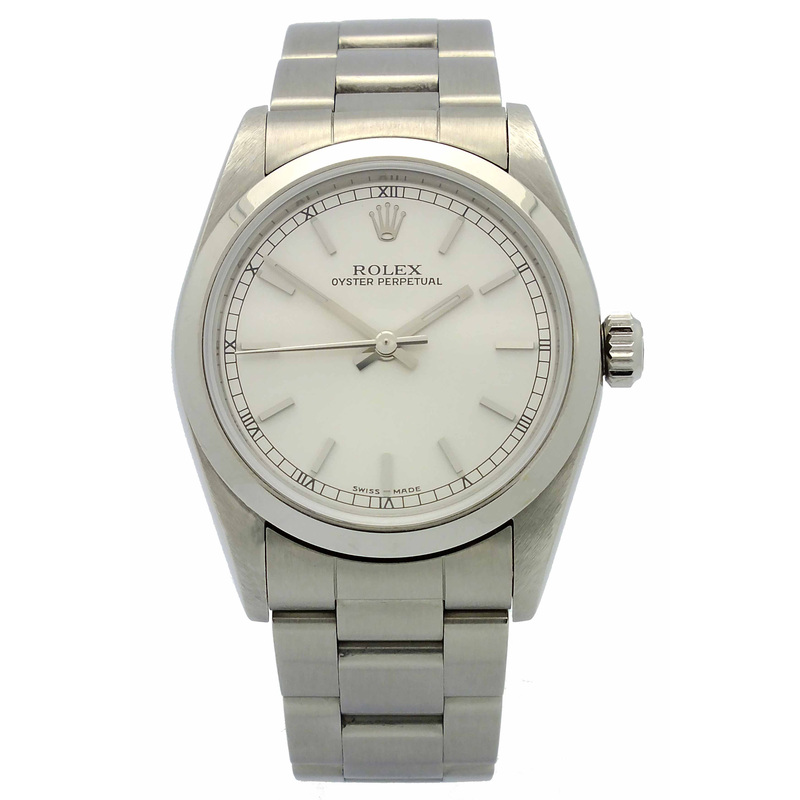 White dial with applied Roman numerals hour markers. 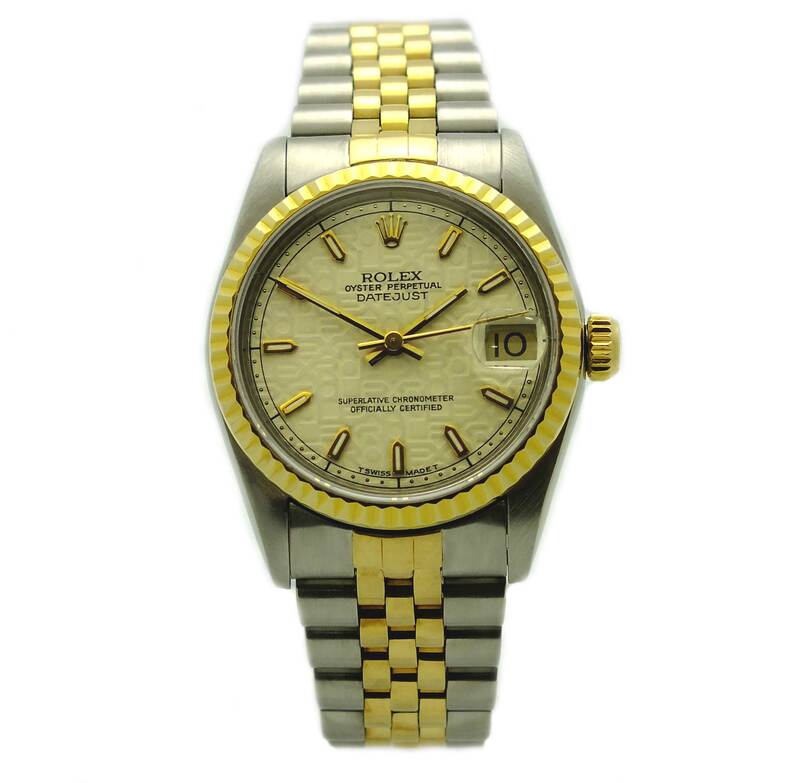 Rolex Oyster Perpetual Datejust in 18kt yellow gold and stainless steel. 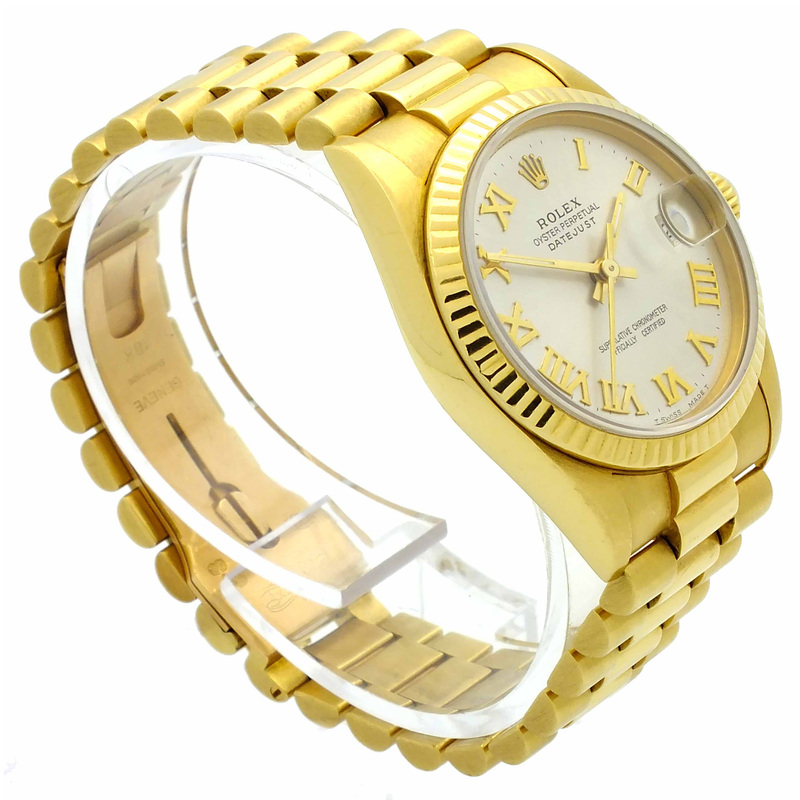 Fluted 18kt yellow gold bezel. 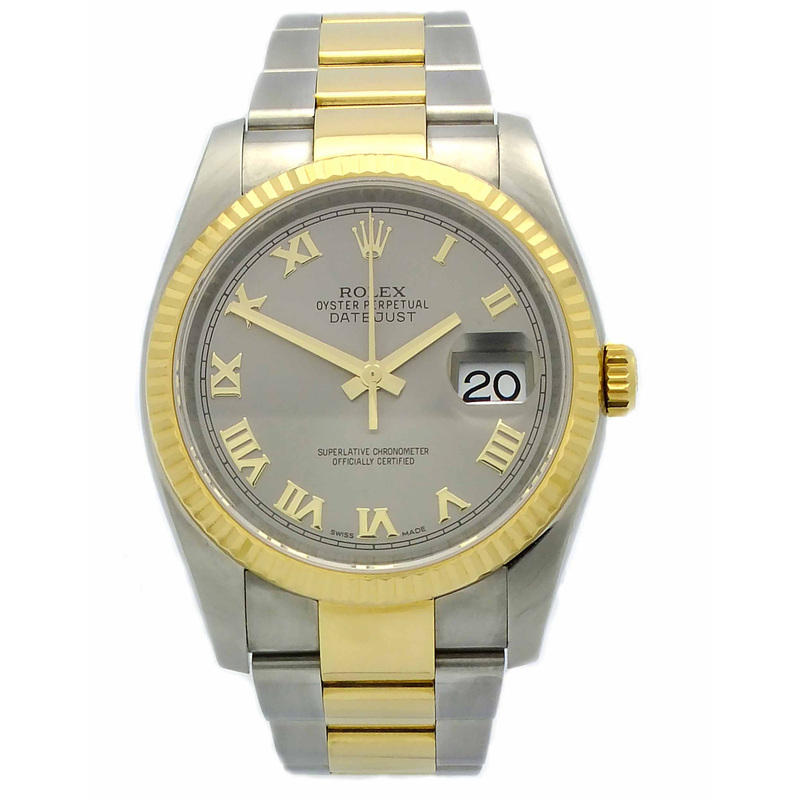 Gray dial with gold tone applied Roman numerals hour markers. 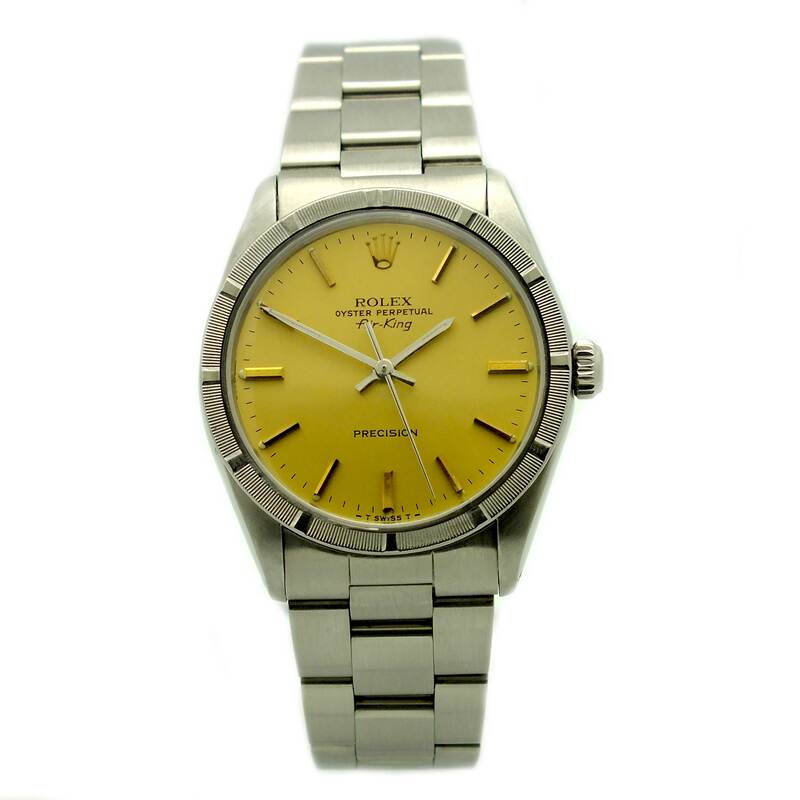 Rolex Air-King Precision 5500 in stainless steel, circa 1989. 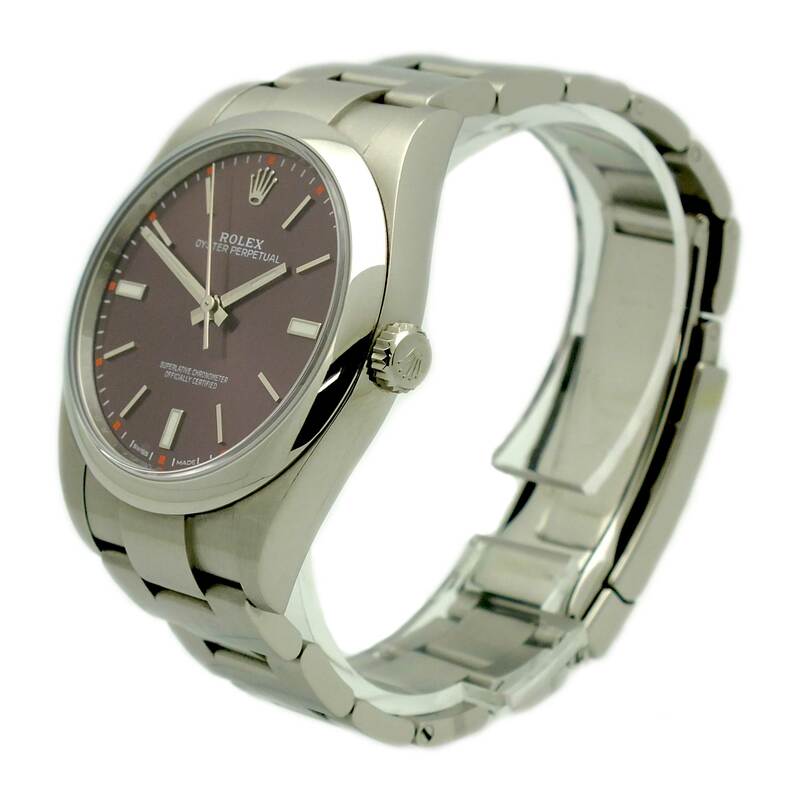 Stainless steel case with screw down case and crown. 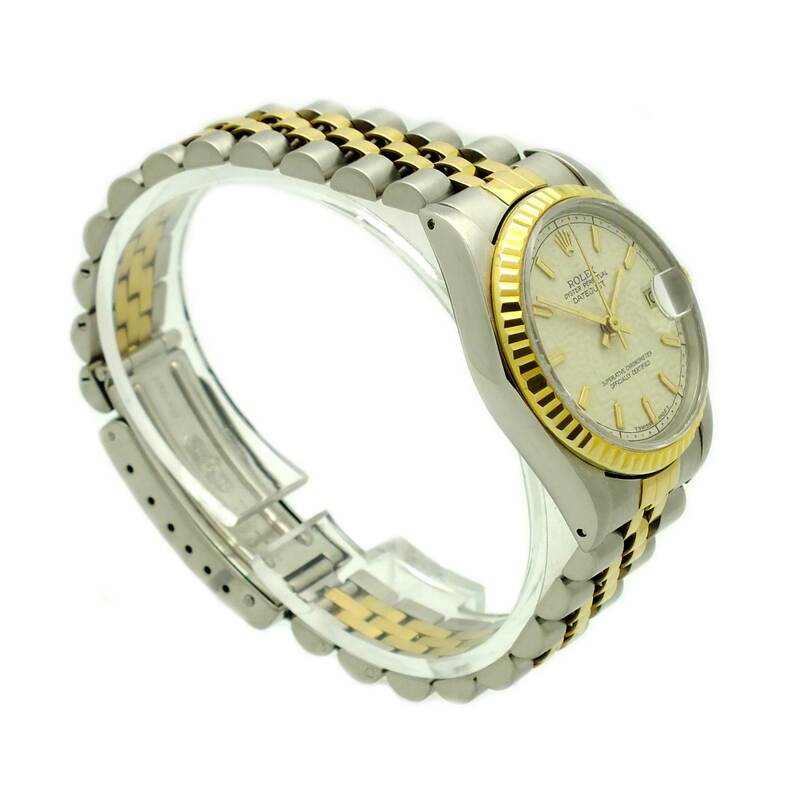 Stainless steel engine turned bezel. 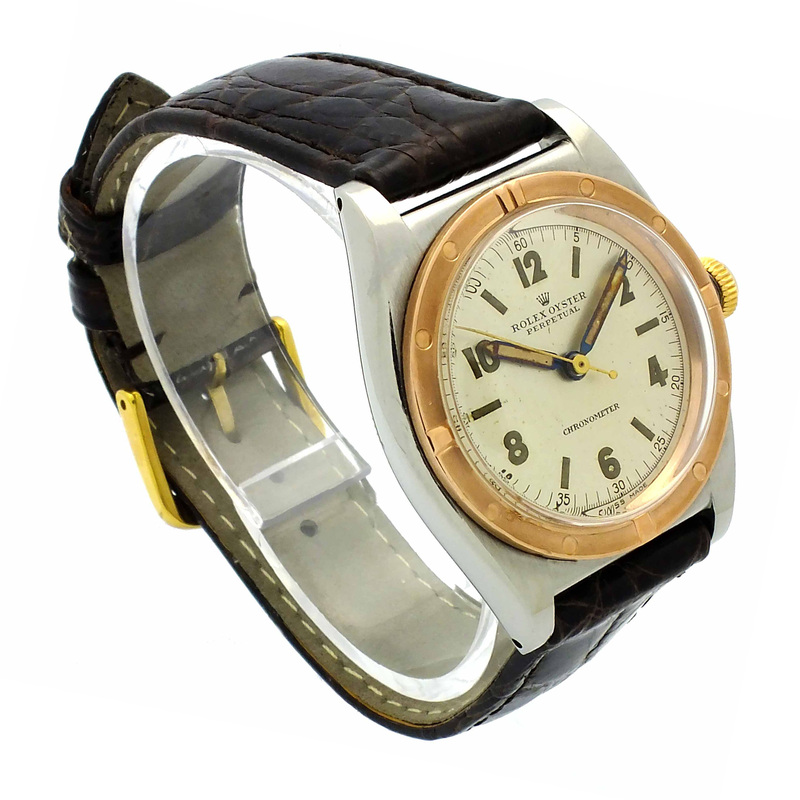 Champagne dial with gold tone index hour markers. 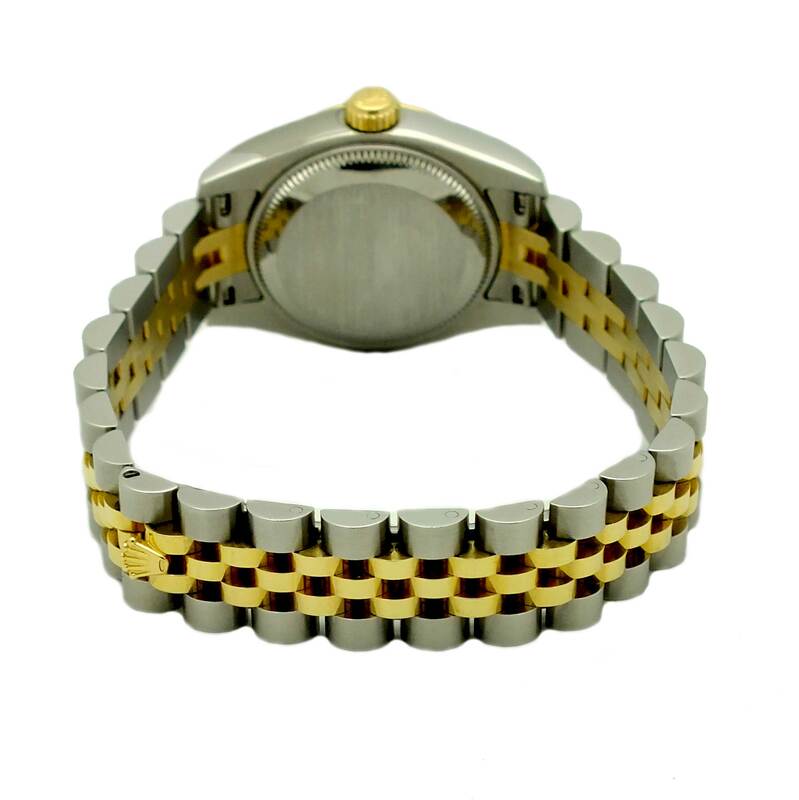 Stainless steel bracelet with fold over clasp. 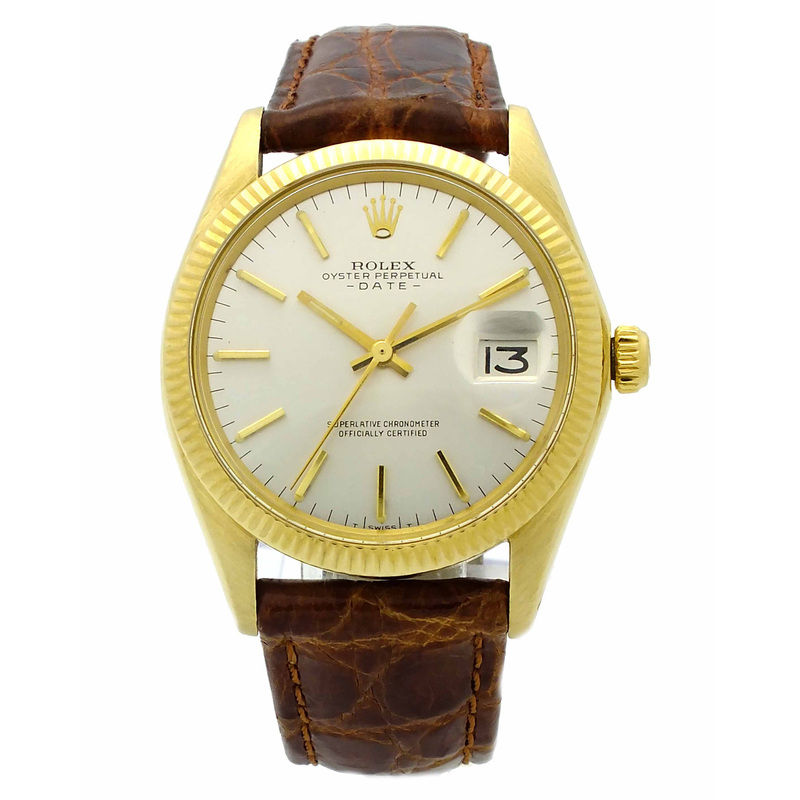 Vintage Rolex Oyster Perpetual Bubble Back in 18kt rose gold, circa 1946. 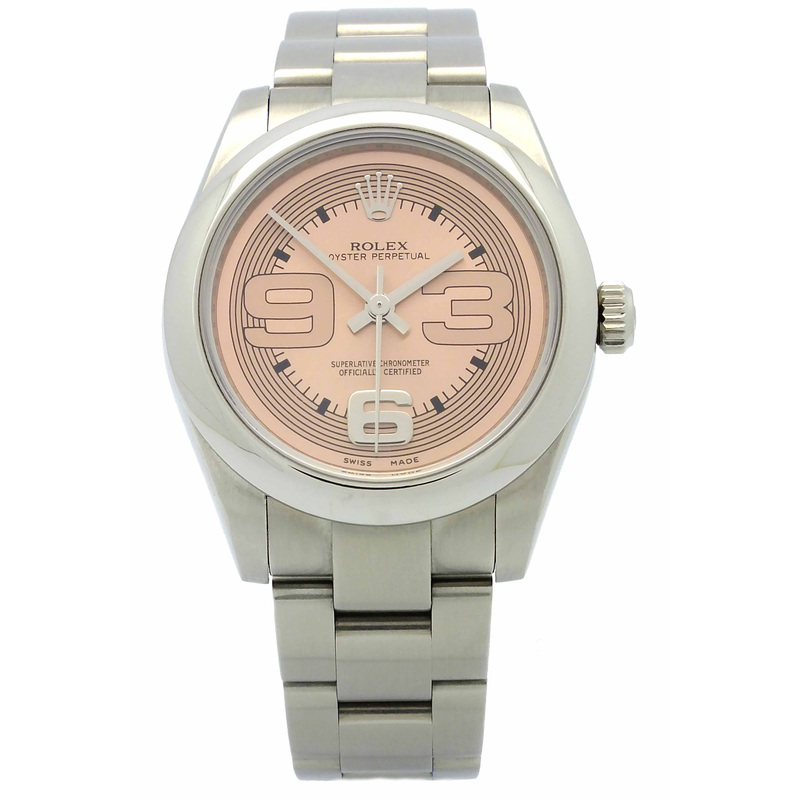 White dial with rose gold tone stick hour markers. 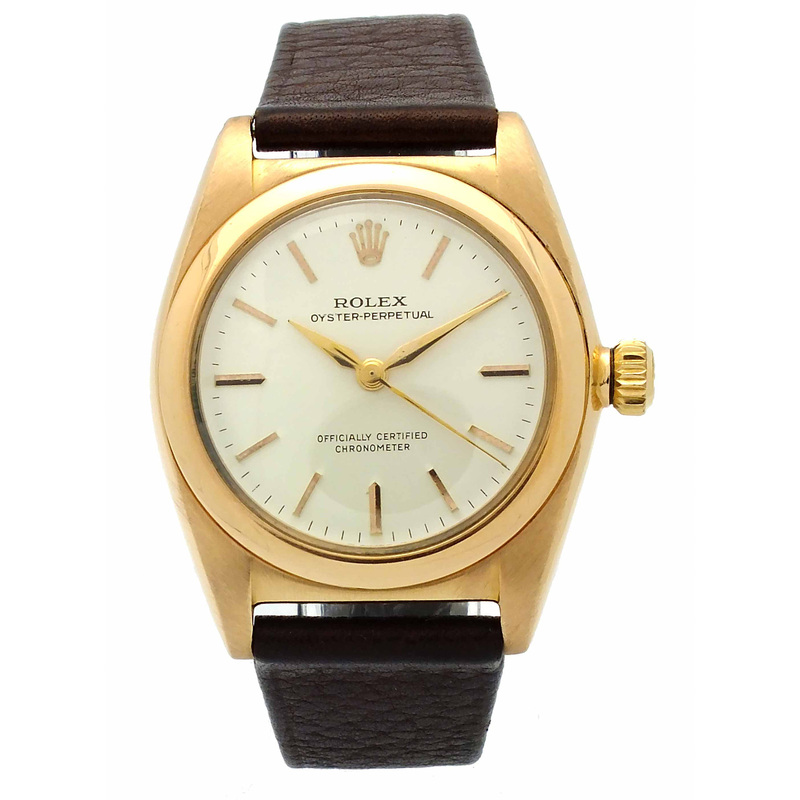 Vintage Rolex Oyster Perpetual Date in 18kt yellow gold, circa 1986. 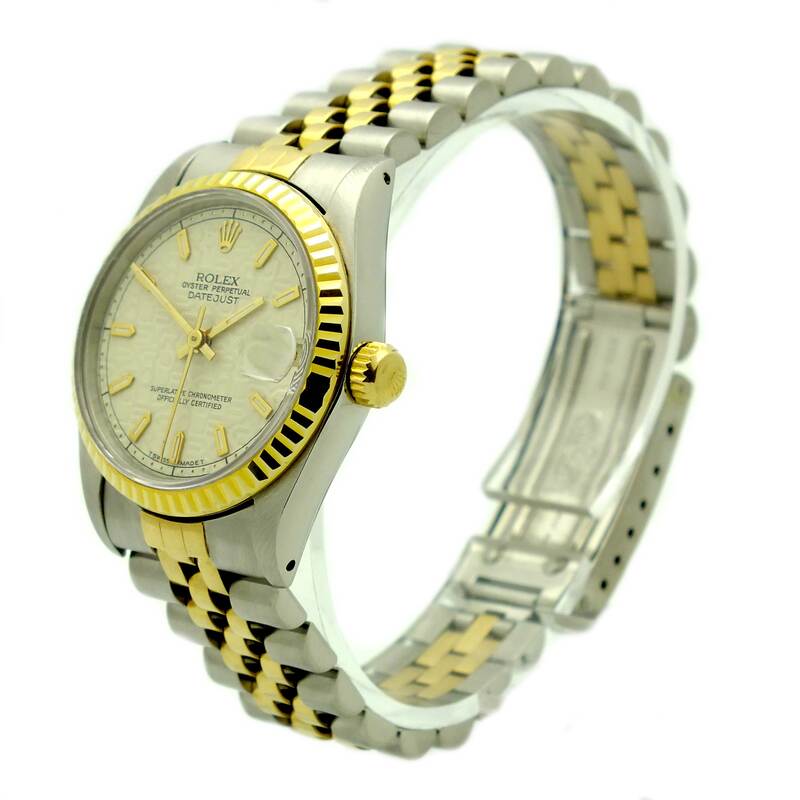 Fluted bezel in 18kt yellow gold. 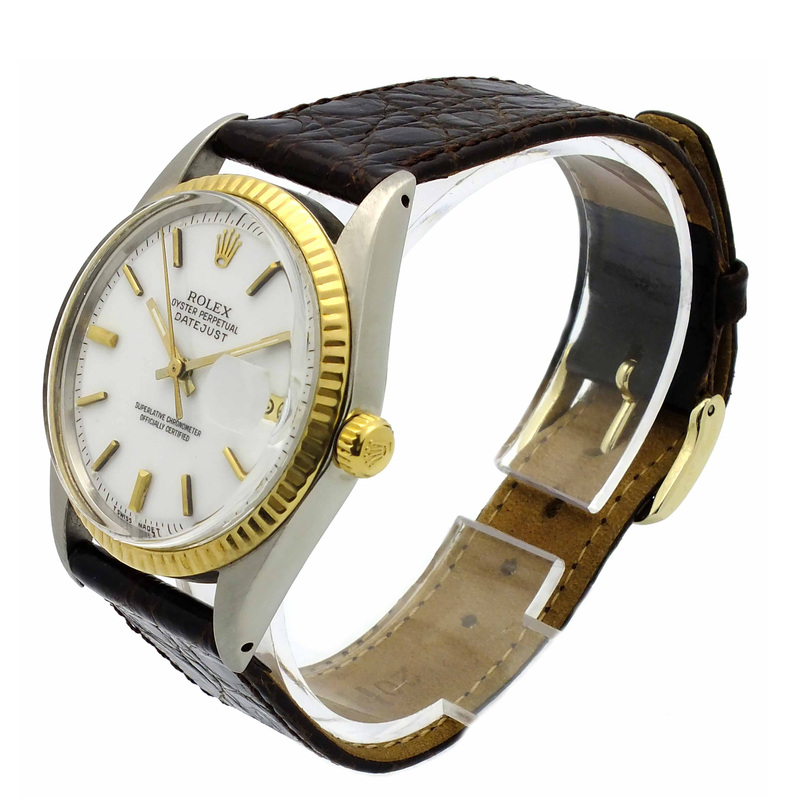 White dial with gold tone stick hour markers. 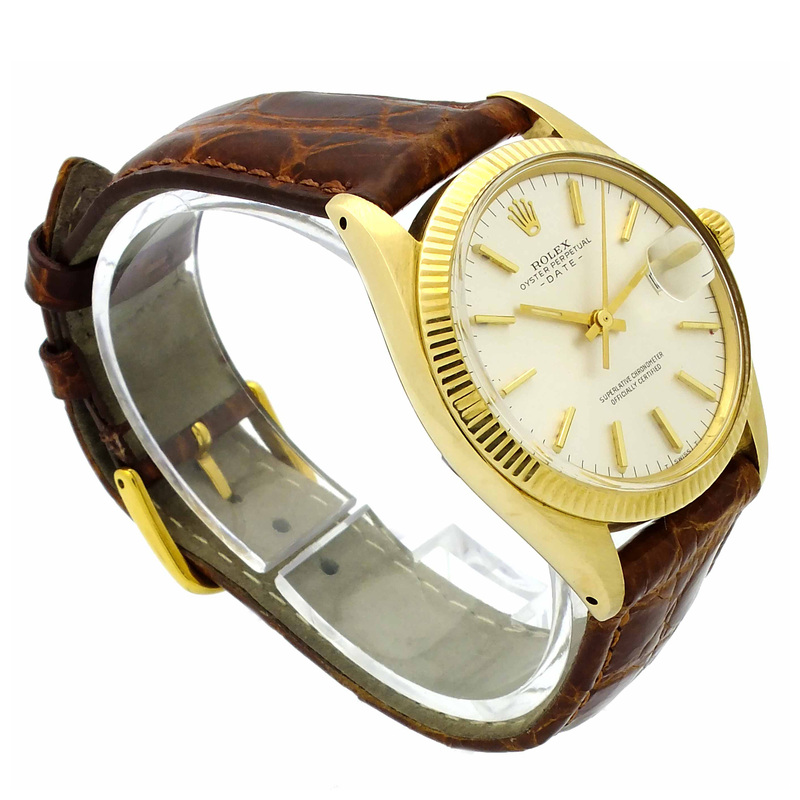 Leather strap. 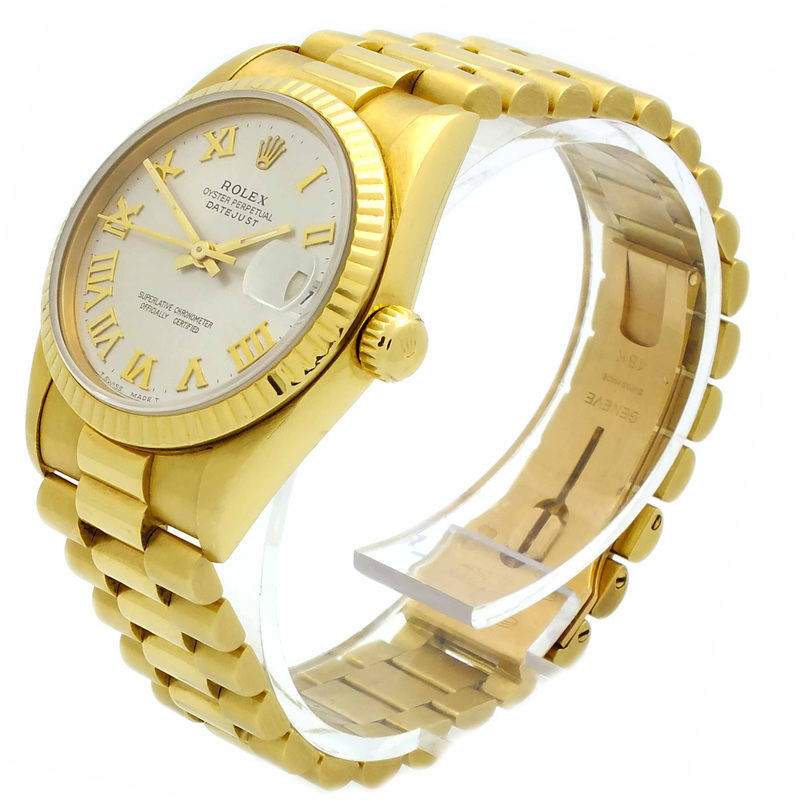 Midsize Rolex Oyster Perpetual Datejust in 18kt yellow gold. 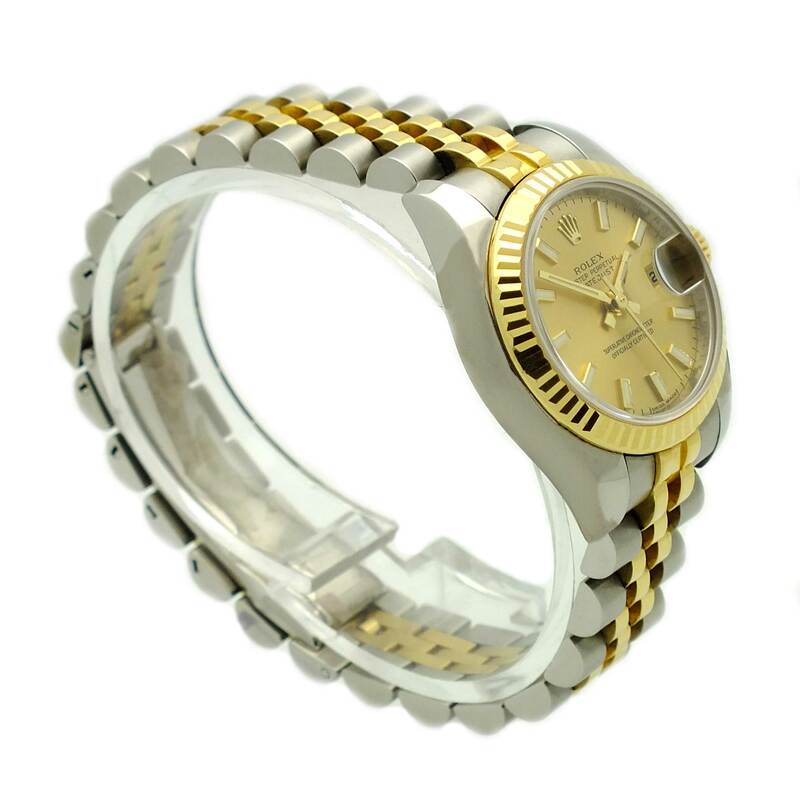 Fluted bezel in 18kt yellow gold. 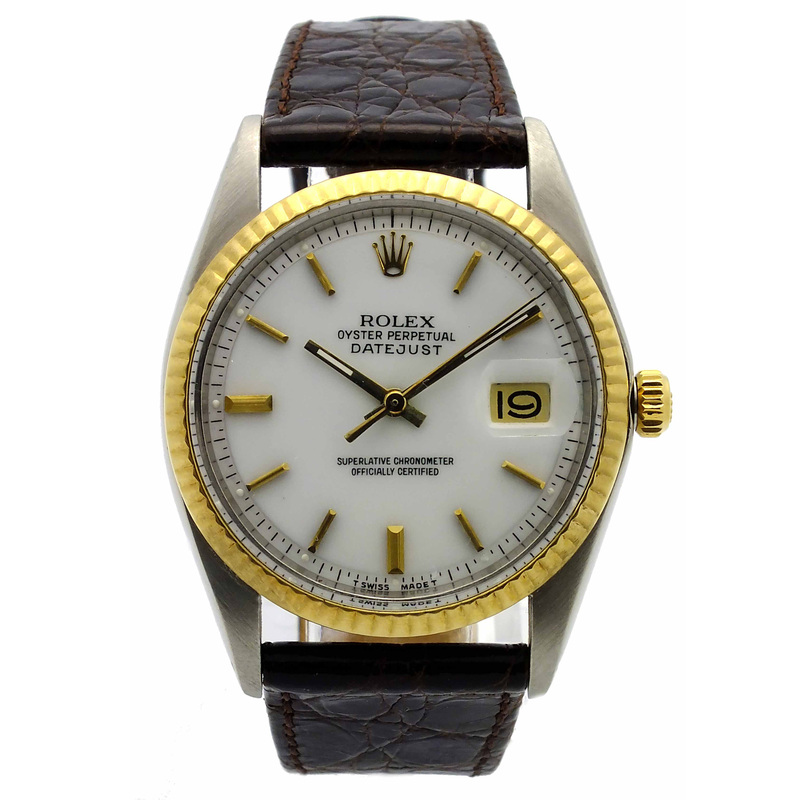 White dial with gold tone Roman numerals hour markers. 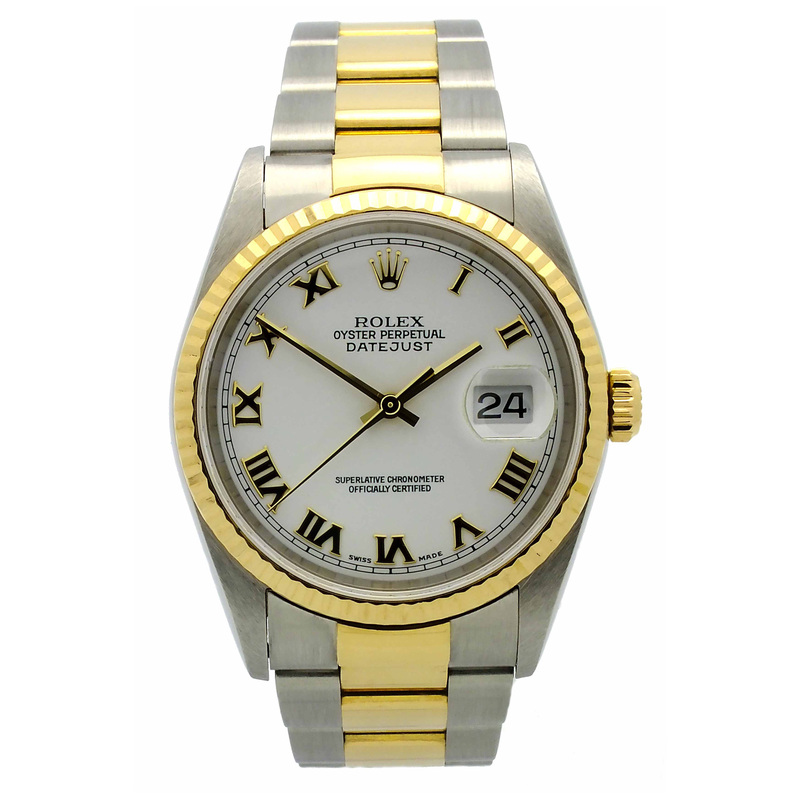 Rolex Datejust in 18kt yellow gold and stainless steel. 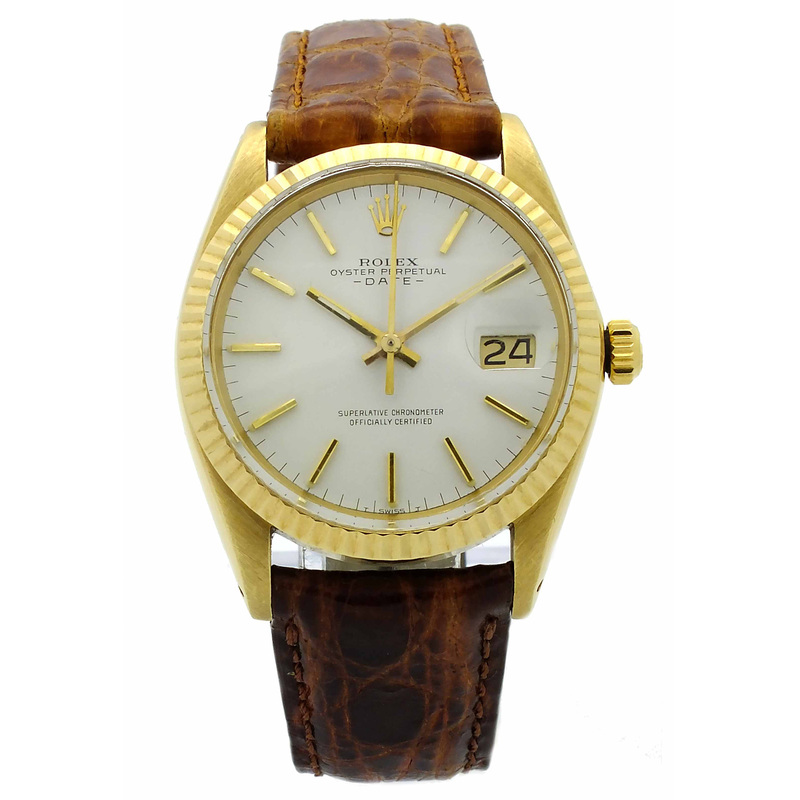 Cream dial with stick hour markers. 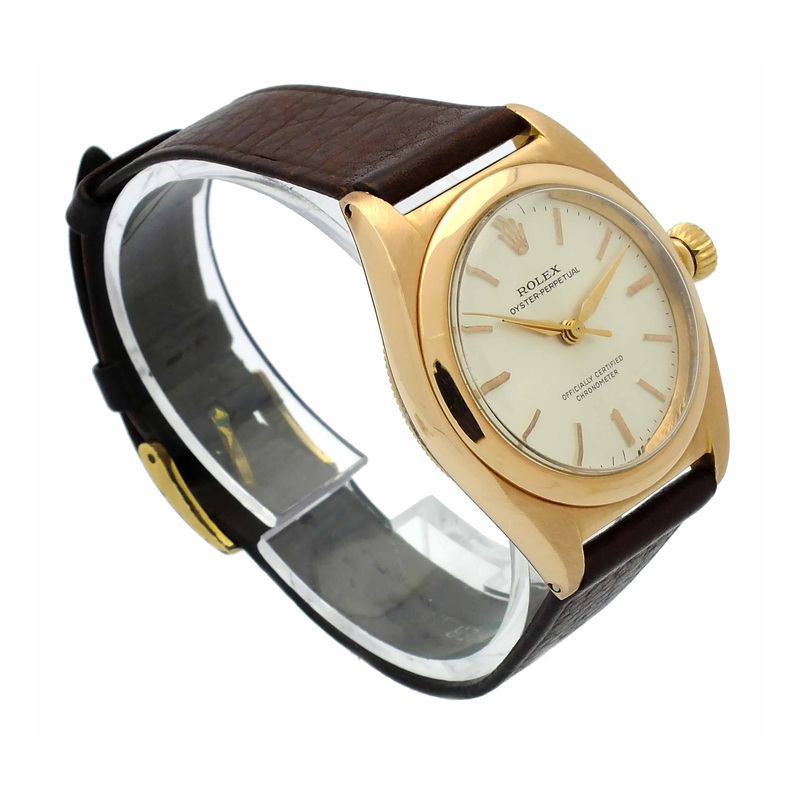 Vintage Rolex Oyster Perpetual Bubble Back in stainless steel with rose gold bezel, circa 1947. 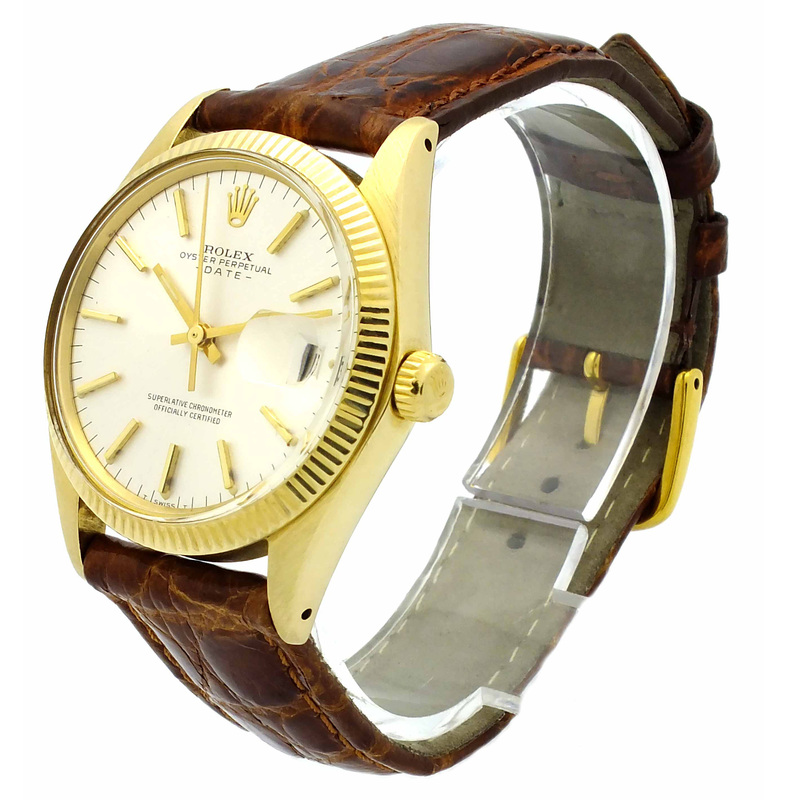 Cream dial with Arabic numerals and stick hour markers. 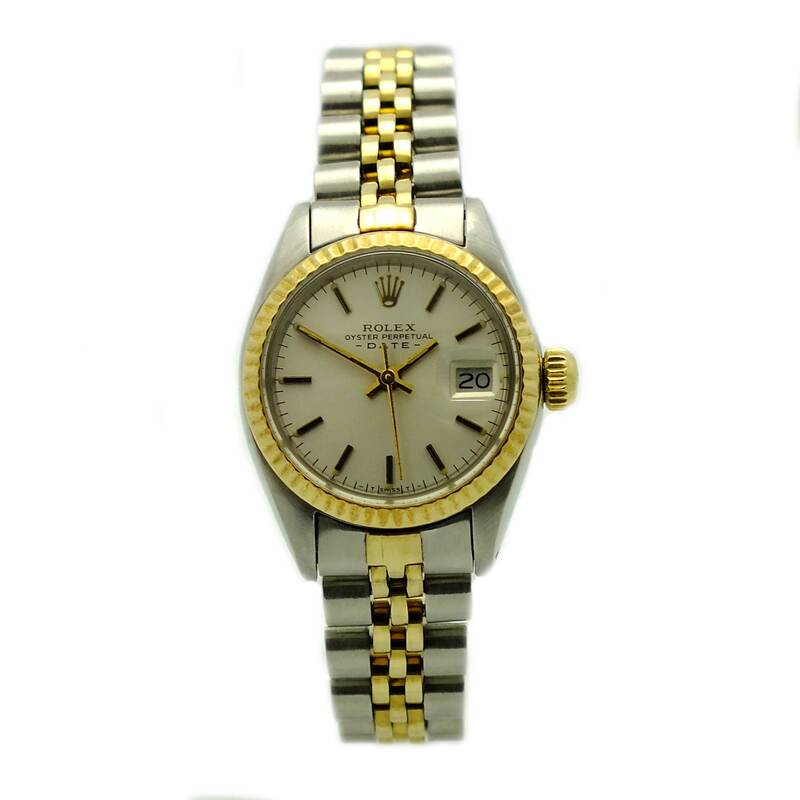 Midsize Rolex Datejust in 18kt yellow gold and stainless steel, circa 1990. 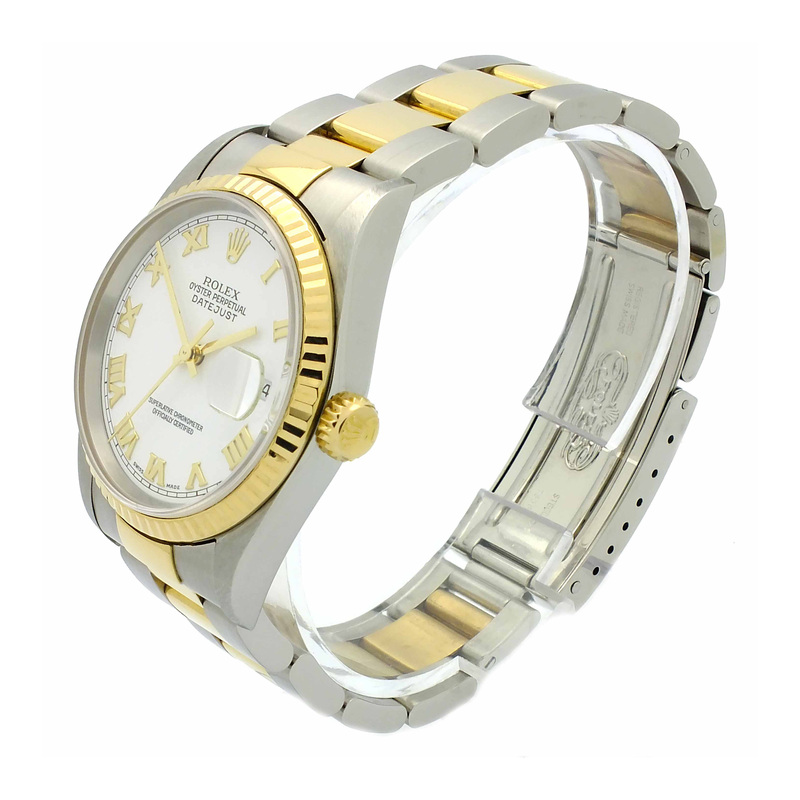 Stainless steel case with fluted 18kt yellow gold bezel. 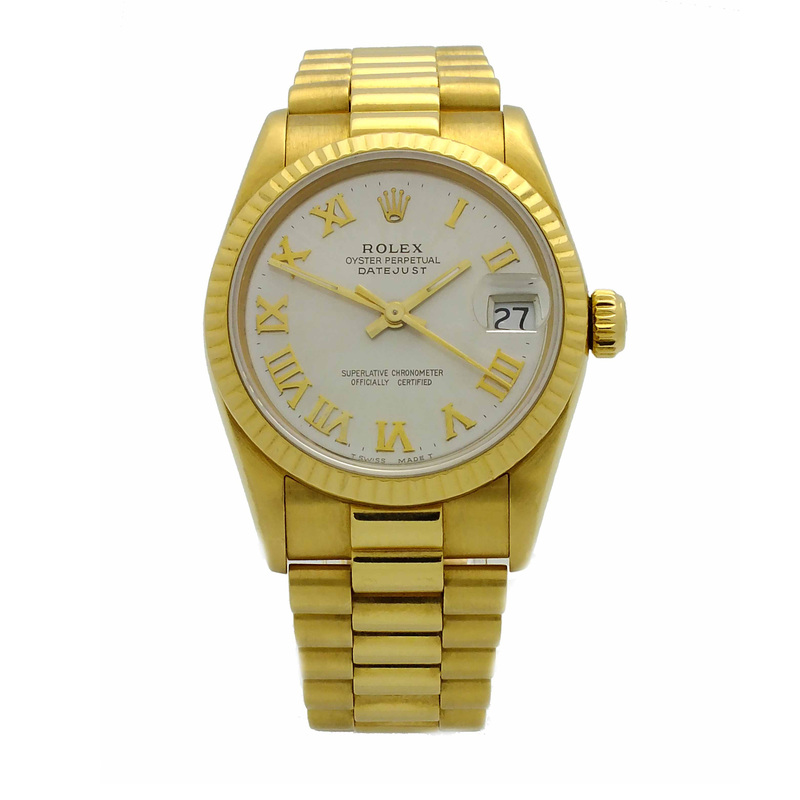 Cream tone Rolex Jubilee dial with gold tone index hour markers. 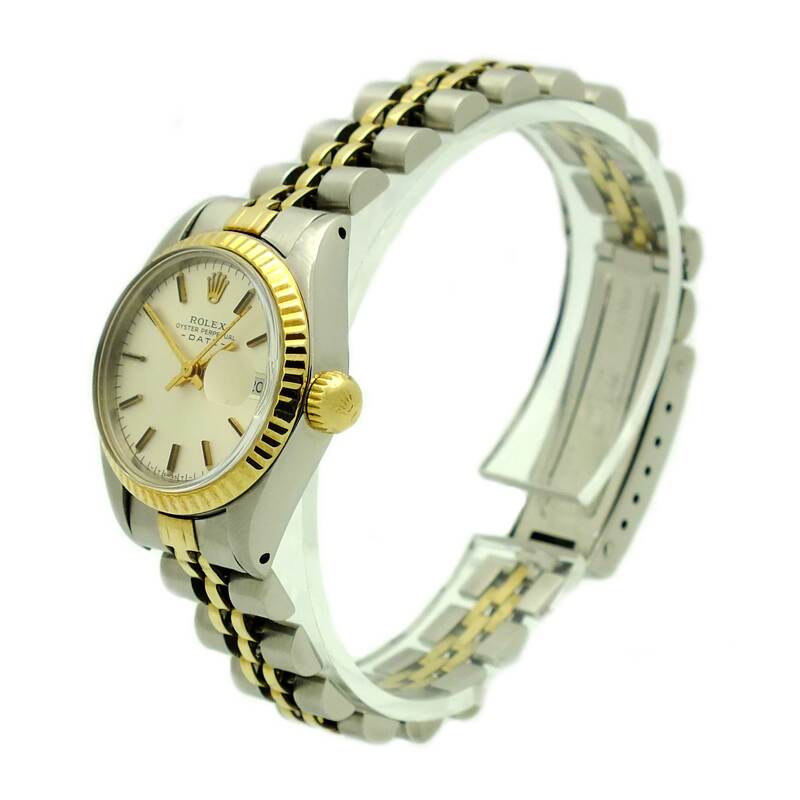 18kt yellow gold and stainless steel Rolex Jubilee bracelet. 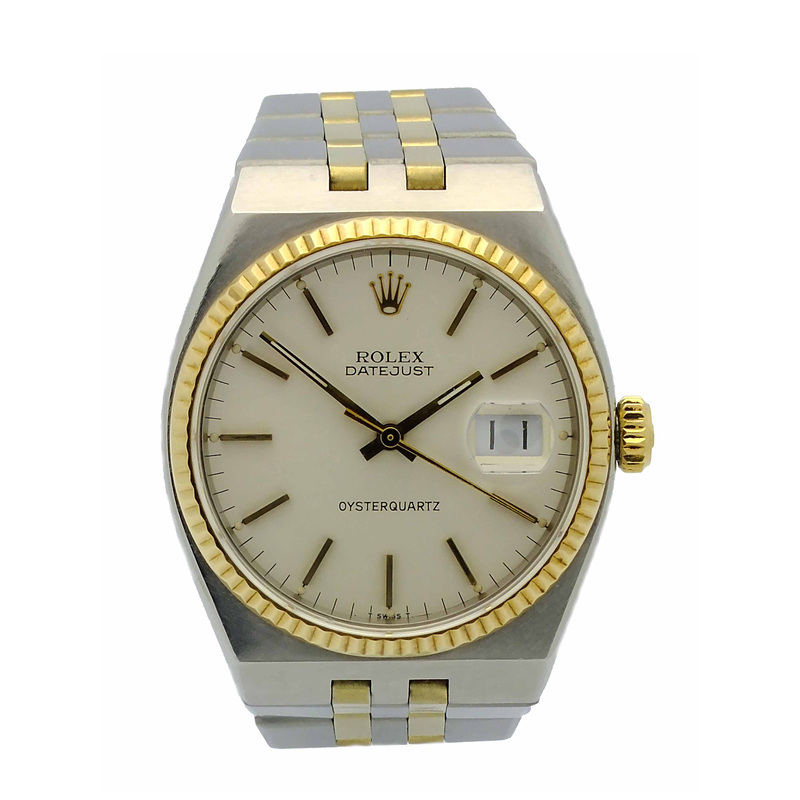 Ladies Rolex Date in 18kt yellow gold and stainless steel, circa 1994. 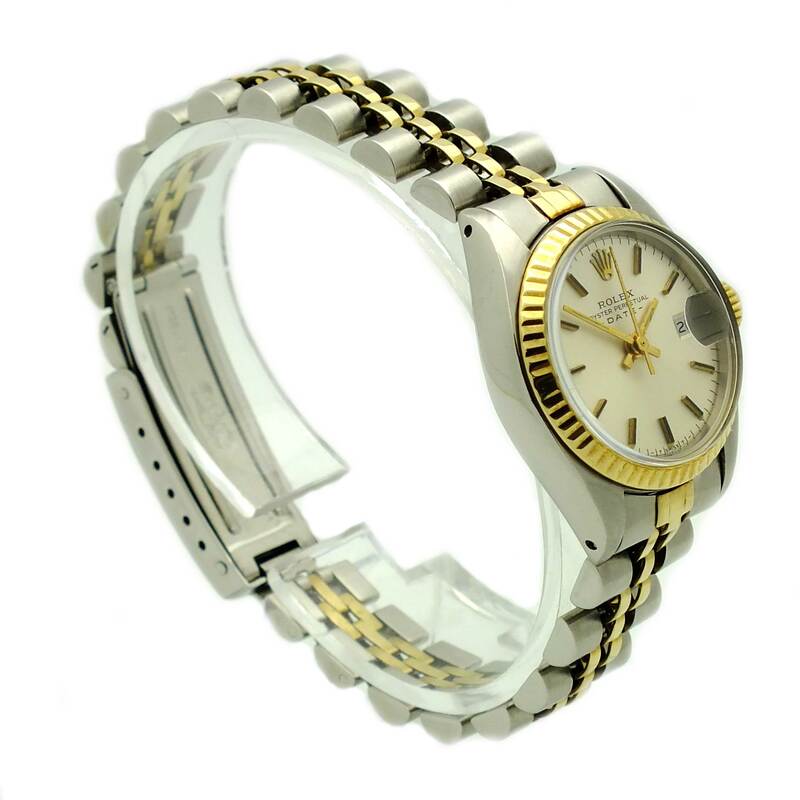 Stainless steel case with fluted 18kt yellow gold bezel. 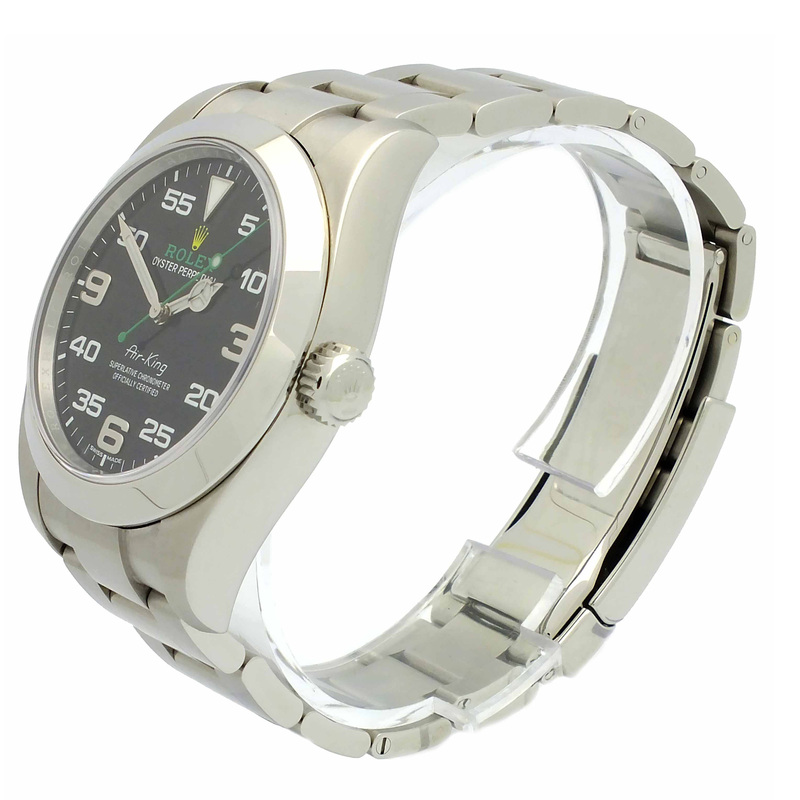 Silver tone dial with index hour markers. 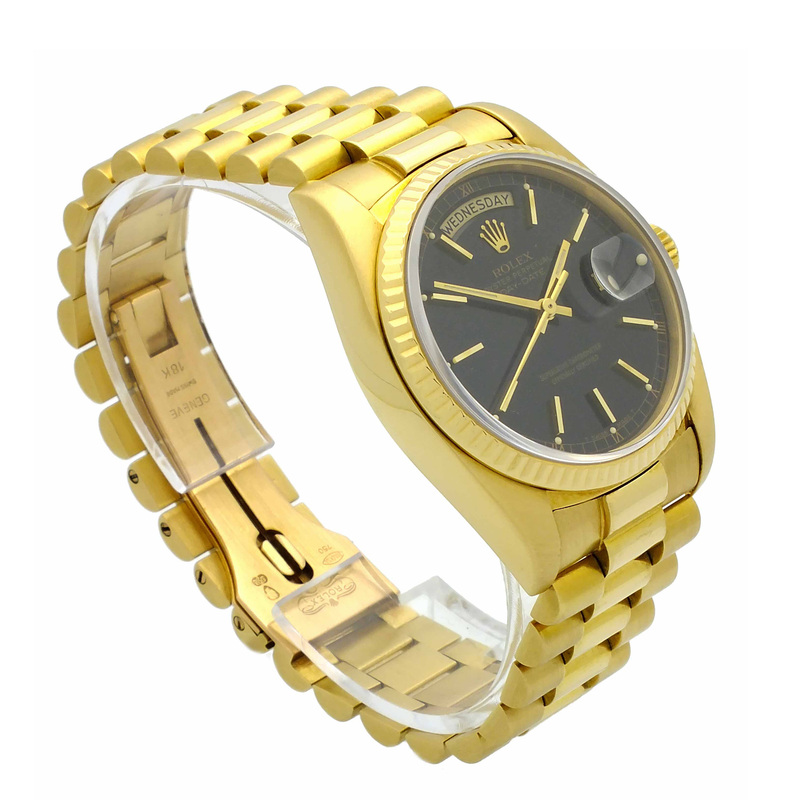 Rolex Jubilee bracelet in 18kt yellow gold and stainless steel. 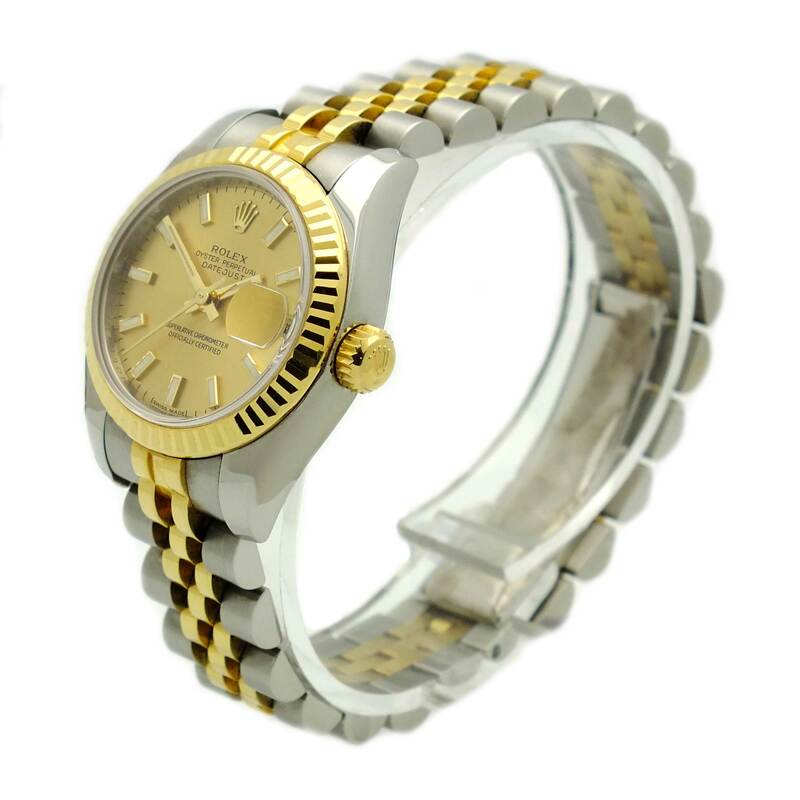 Ladies Rolex Datejust in 18kt yellow gold and stainless steel. 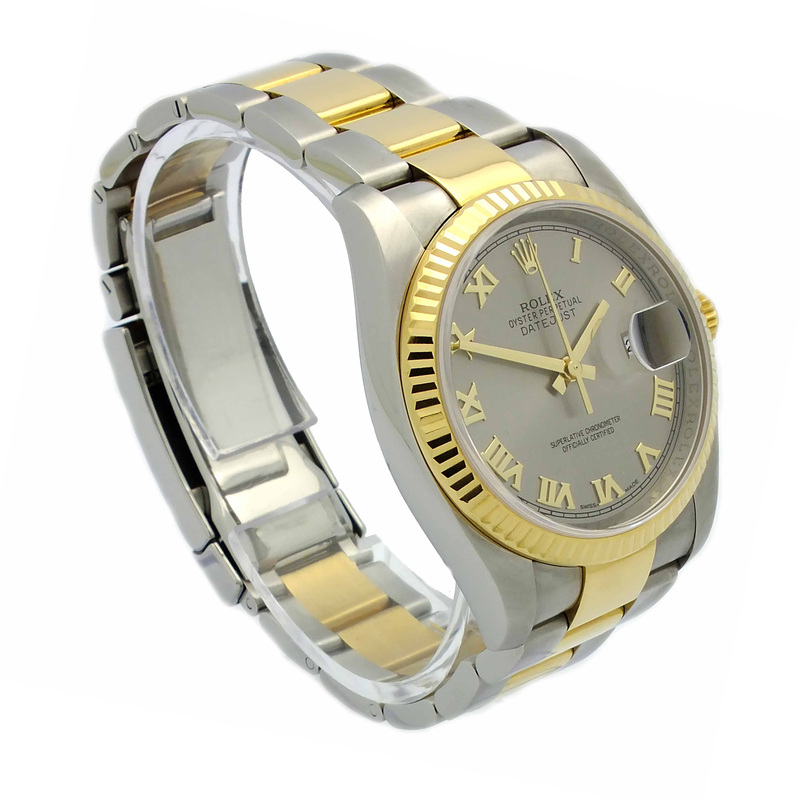 Stainless steel case with 18kt yellow gold fluted bezel. 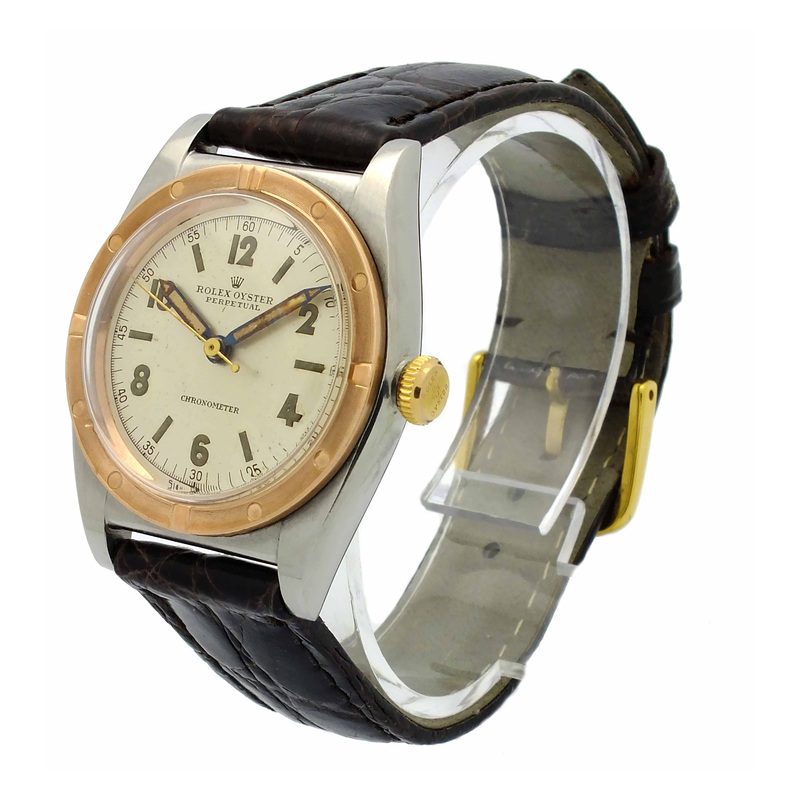 Champagne dial with index hour markers. 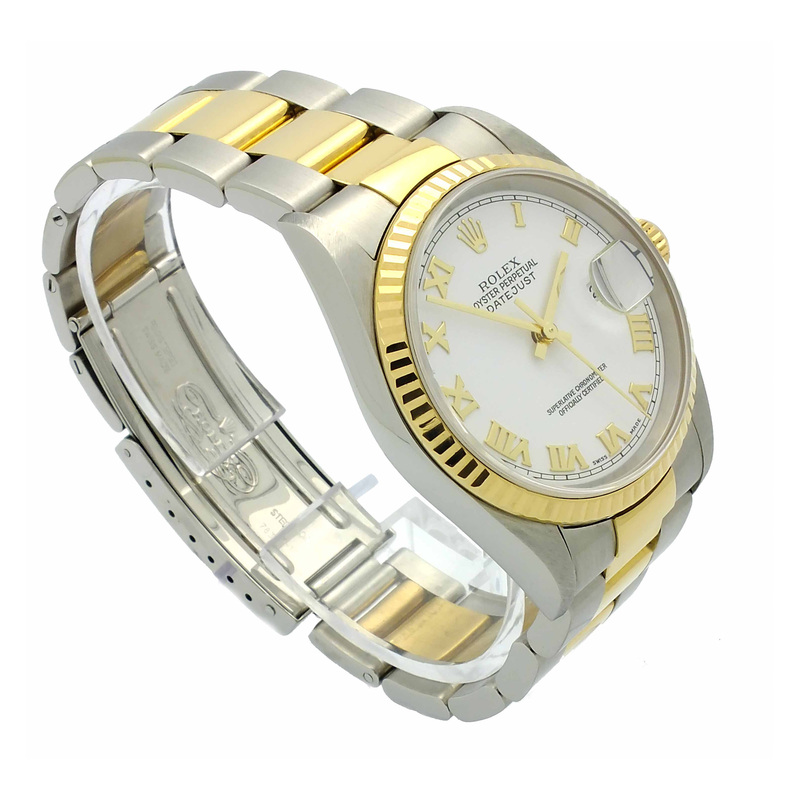 18kt yellow gold and stainless steel Rolex Jubilee bracelet. 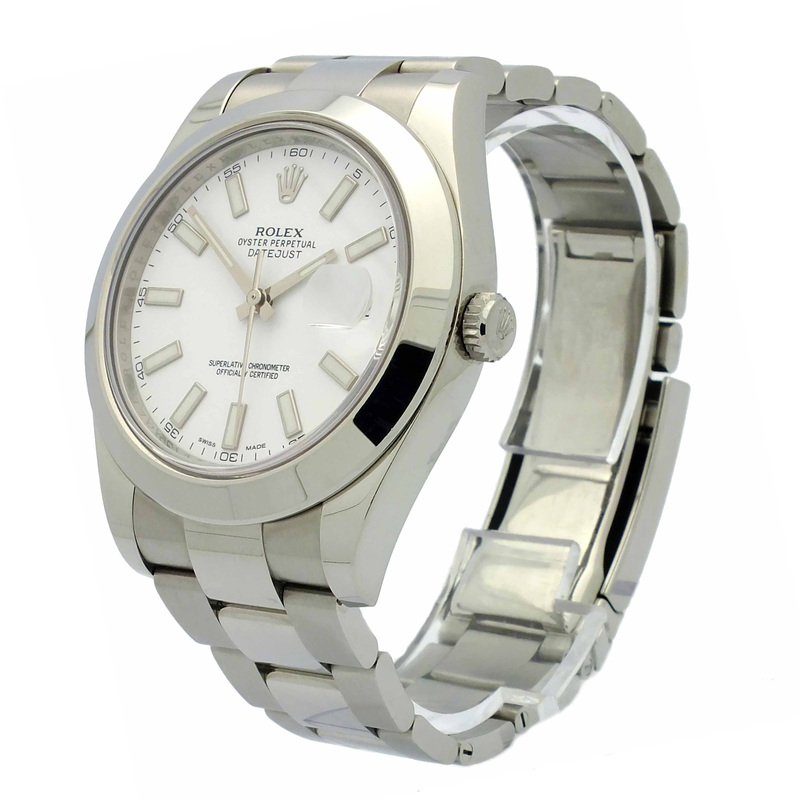 Midsize Rolex Oyster Perpetual Datejust in stainless steel. 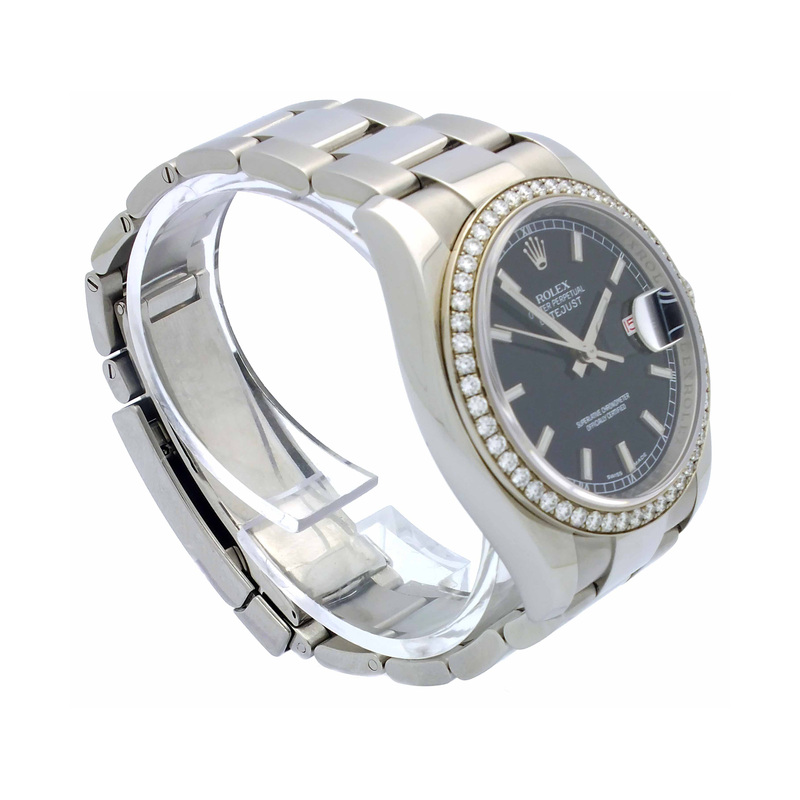 Smooth stainless steel bezel. 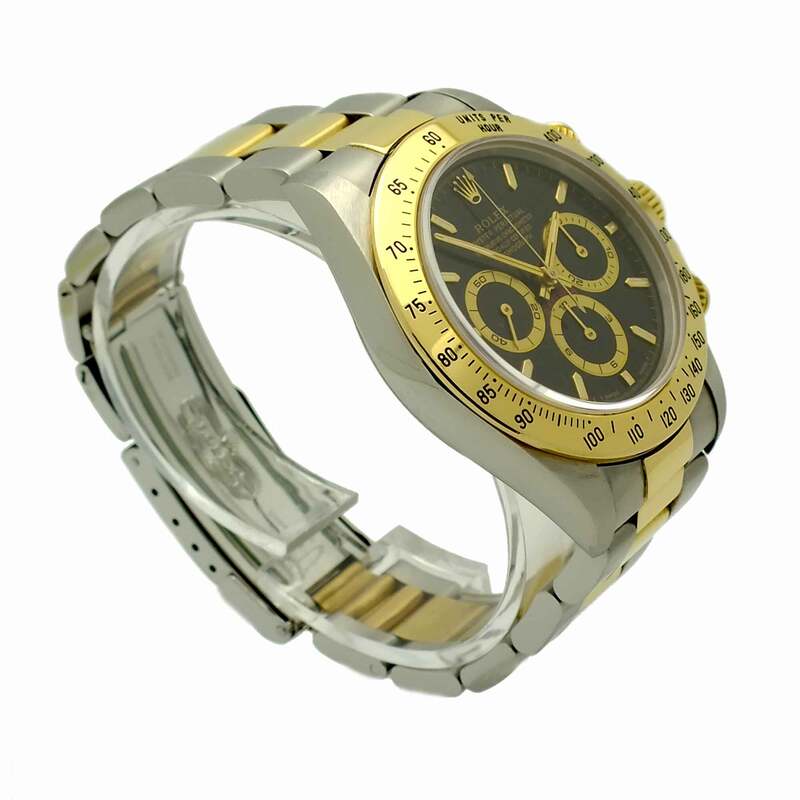 Rolex Oyster bracelet. 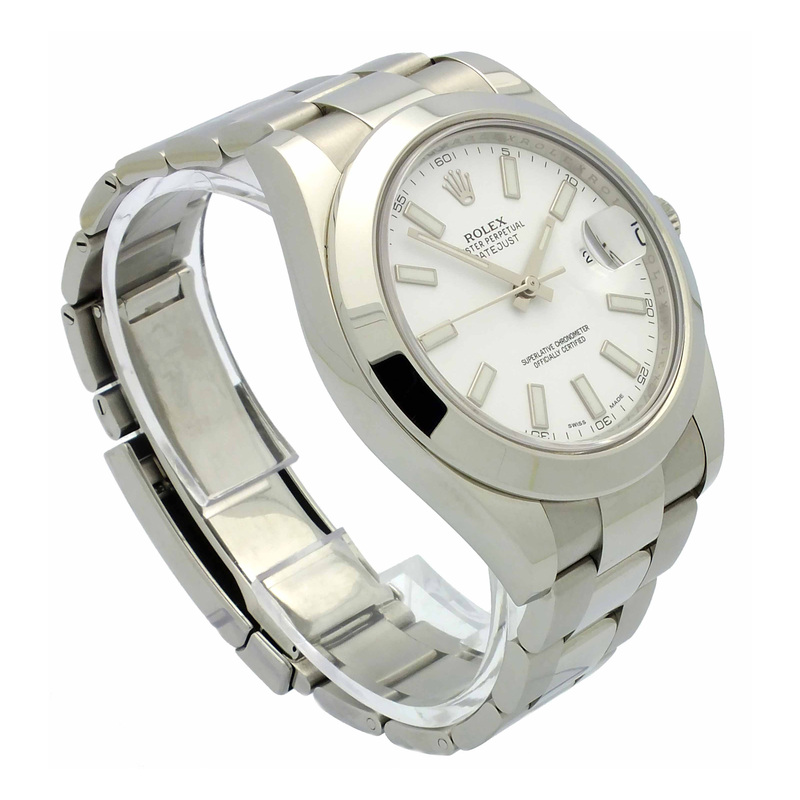 Rolex Oyster Perpetual 39 in stainless steel. 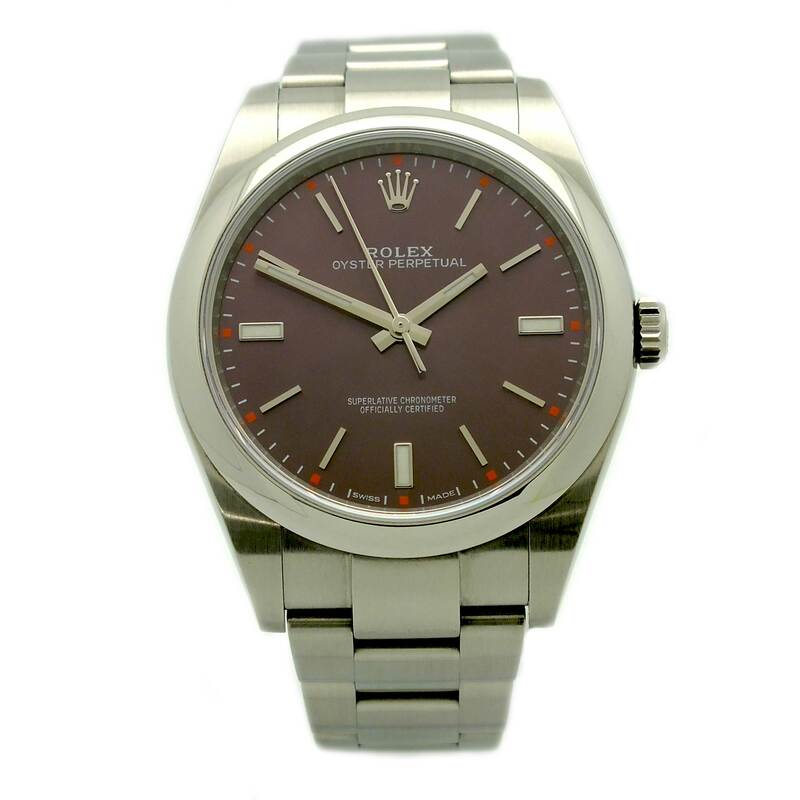 Red grape dial with silver tone index hour markers. 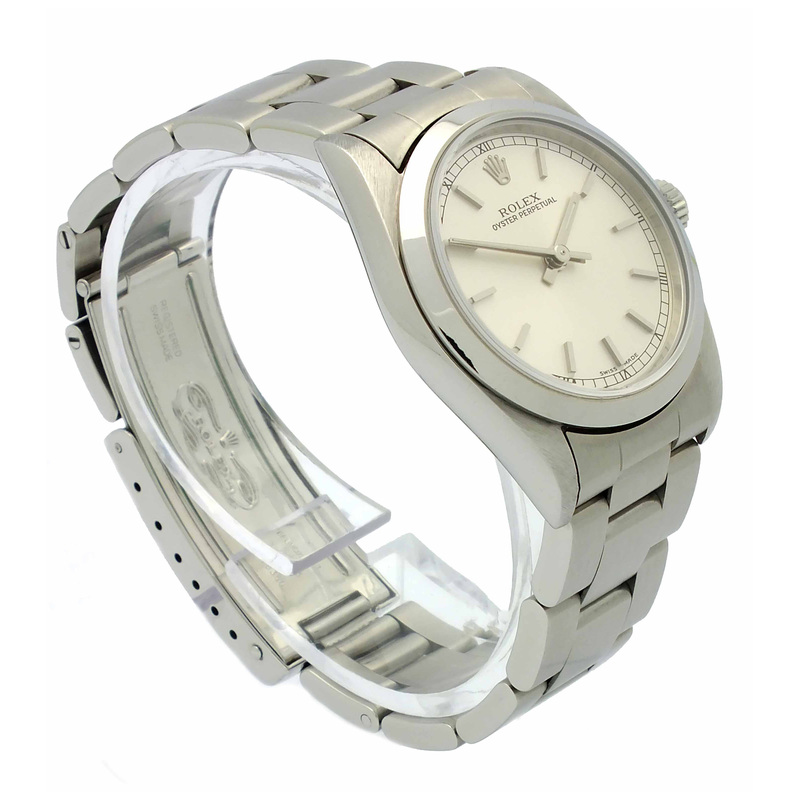 Fixed smooth stainless steel bezel. 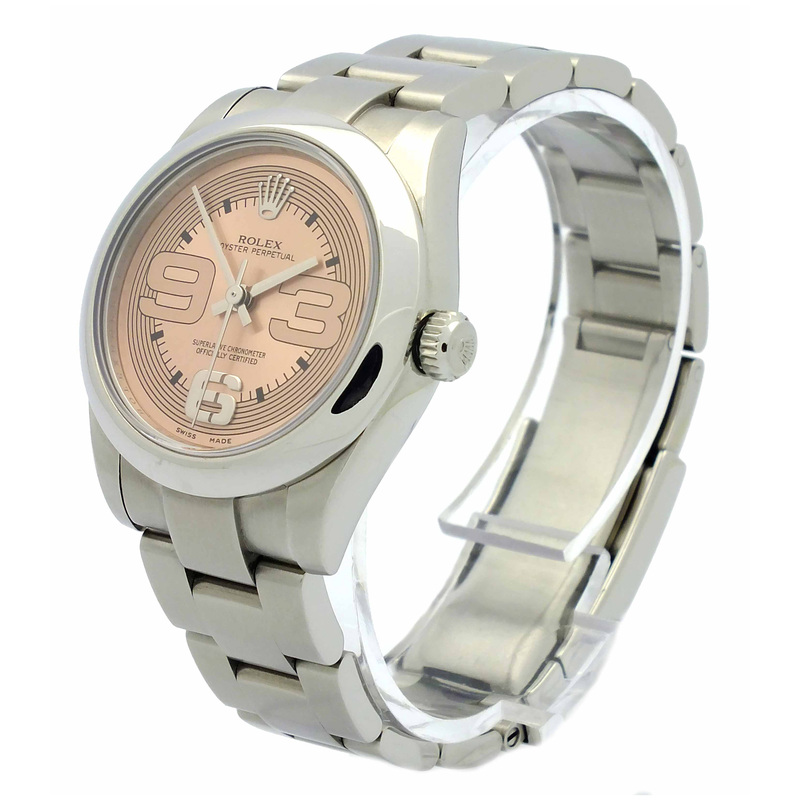 Stainless steel Rolex oyster band. 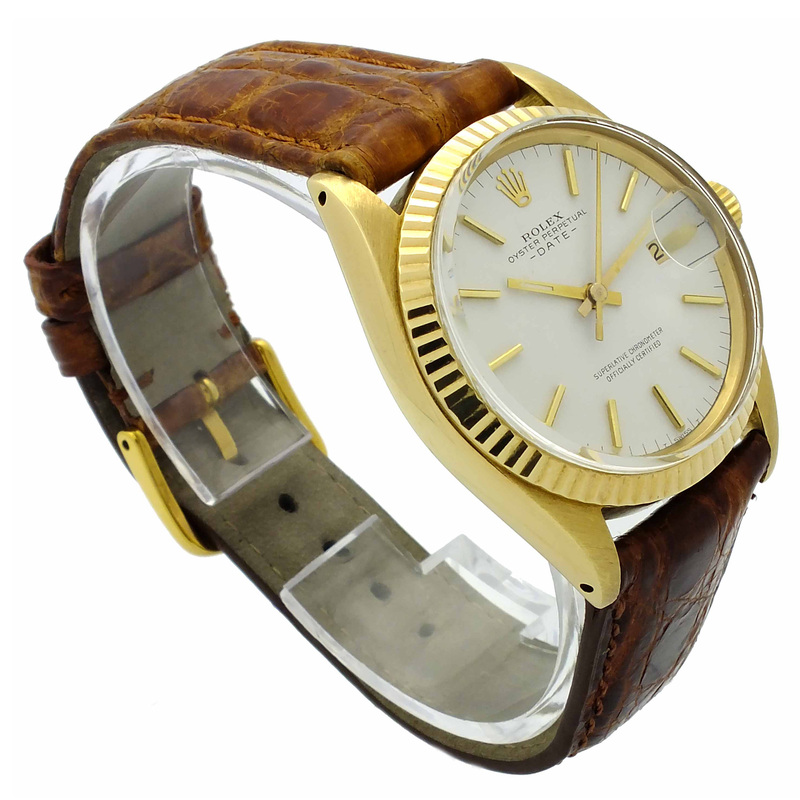 Vintage Rolex Oyster Perpetual Datejust in stainless steel with fluted bezel in 18kt yellow gold. Circa 1973. 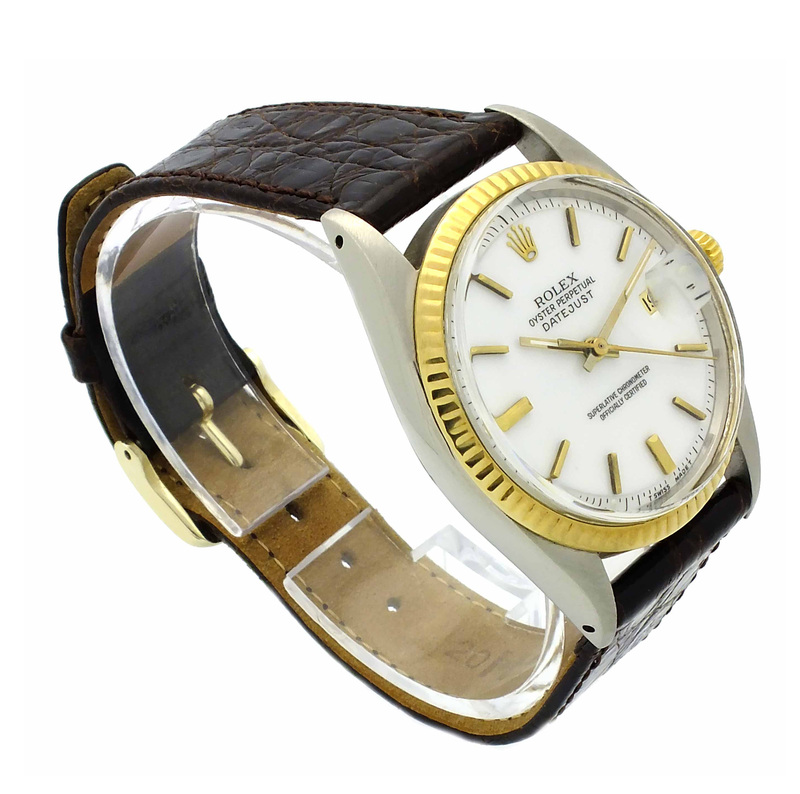 White dial with gold tone stick hour markers. 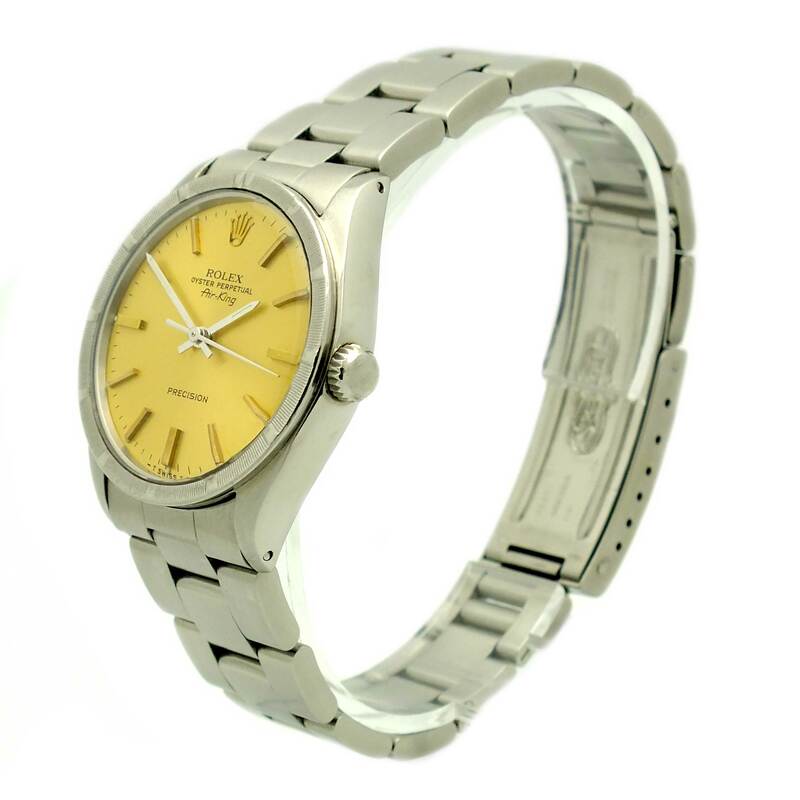 Vintage Rolex Oyster Perpetual Date in 18kt yellow gold. 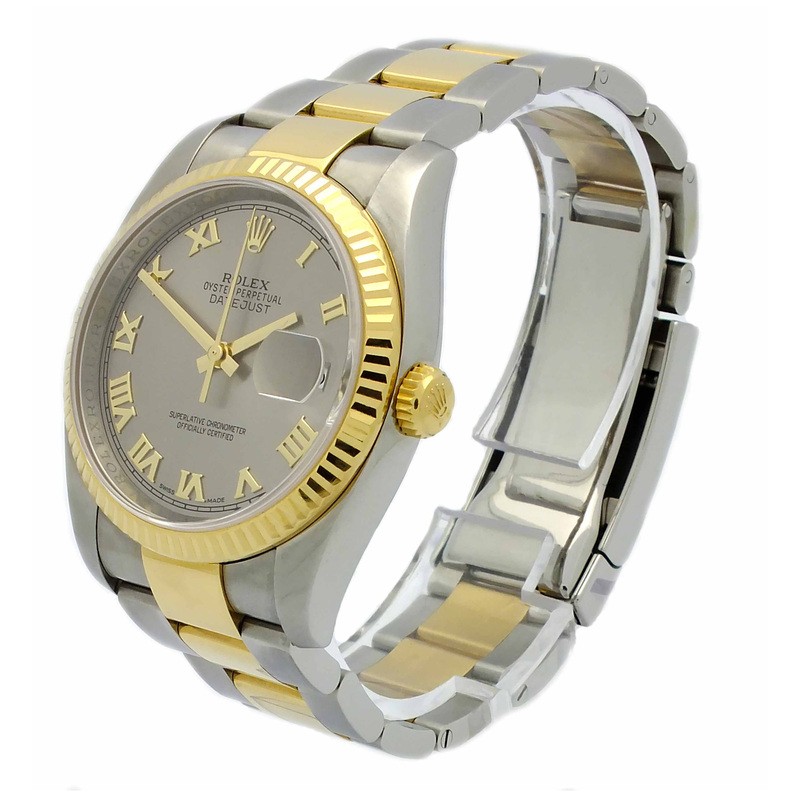 Fluted bezel in 18kt yellow gold.Silver dial with gold tone stick hour markers. 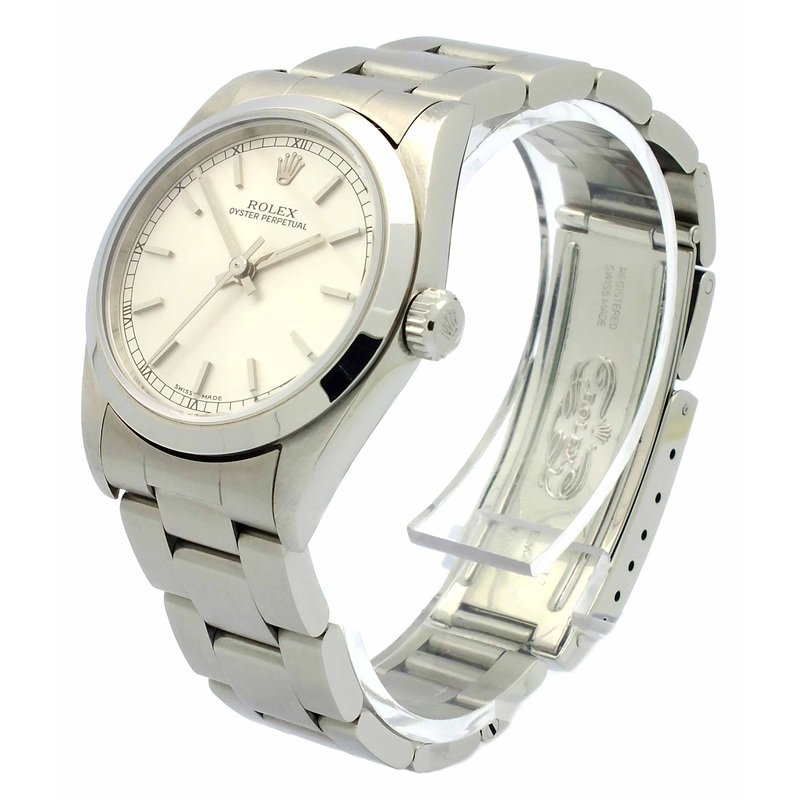 Midsize Rolex Oyster Perpetual in stainless steel with smooth stainless steel bezel. 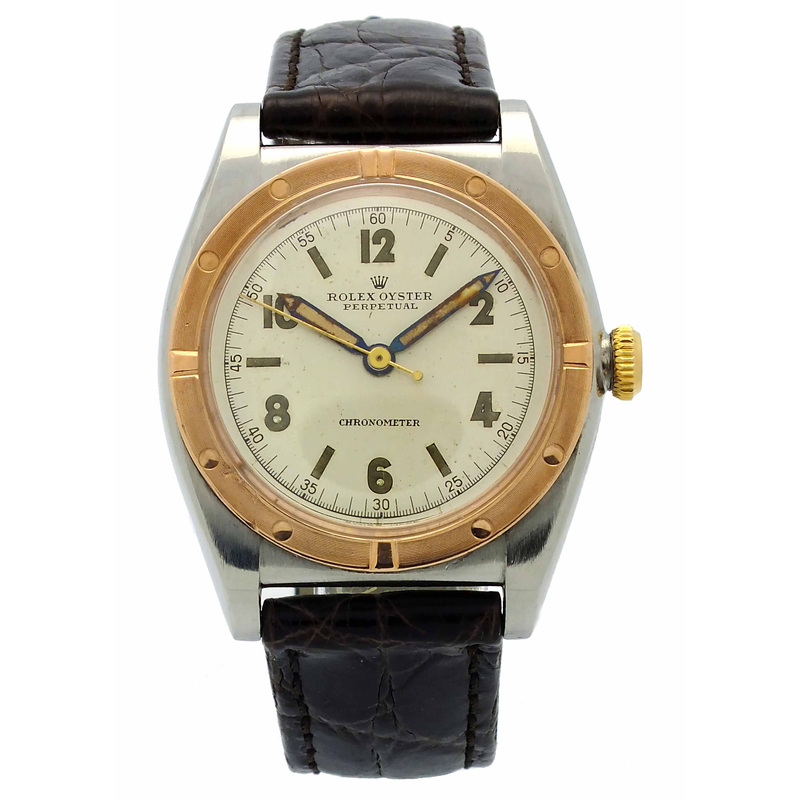 White dial with stick hour markers. 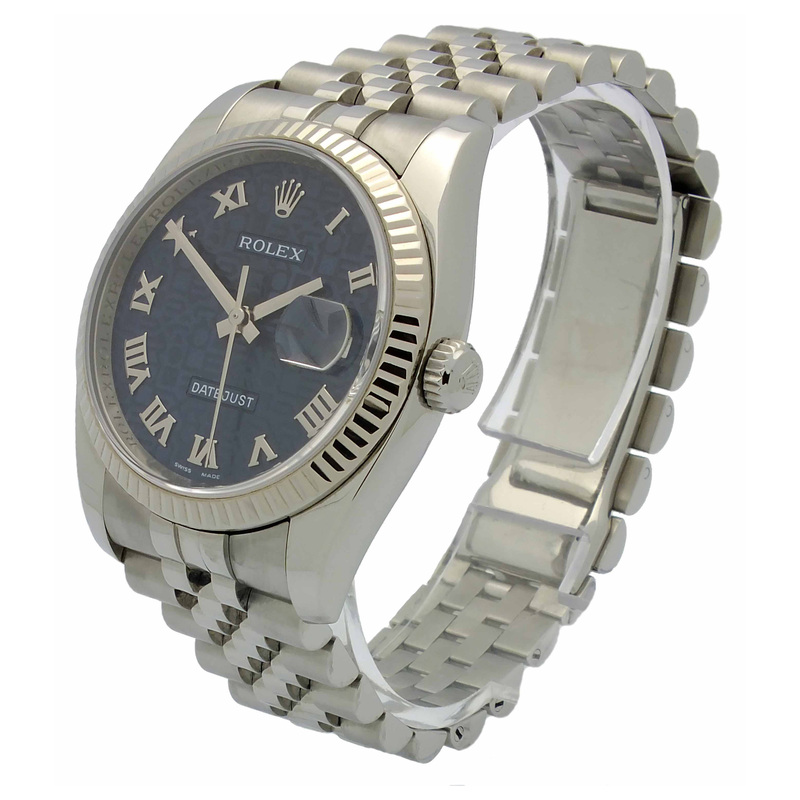 Stainless steel Rolex Oyster bracelet. 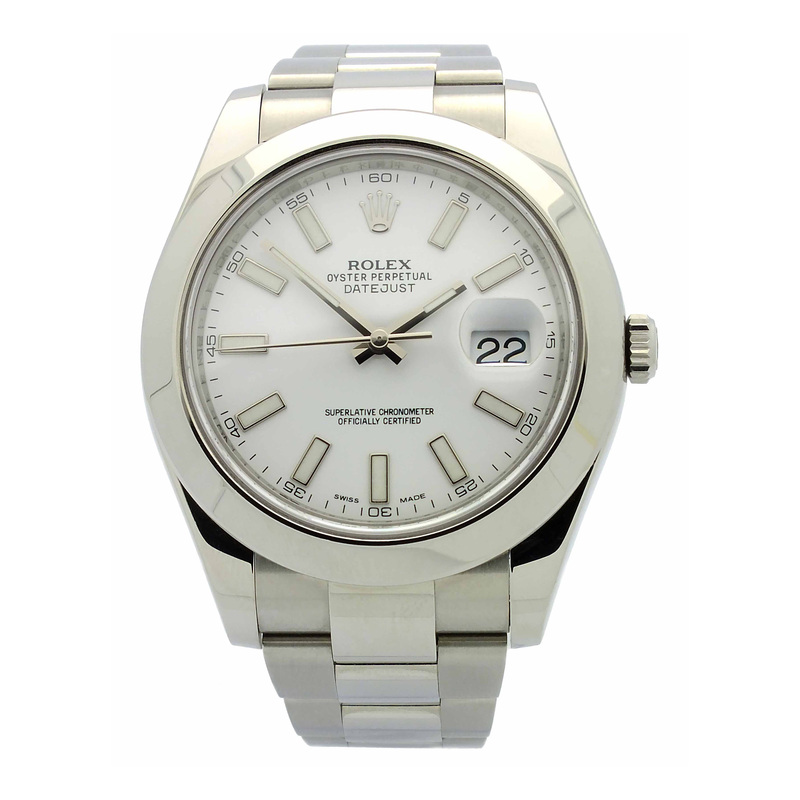 Rolex Oyster Perpetual Datejust II in stainless steel.Smooth stainless steel bezel. 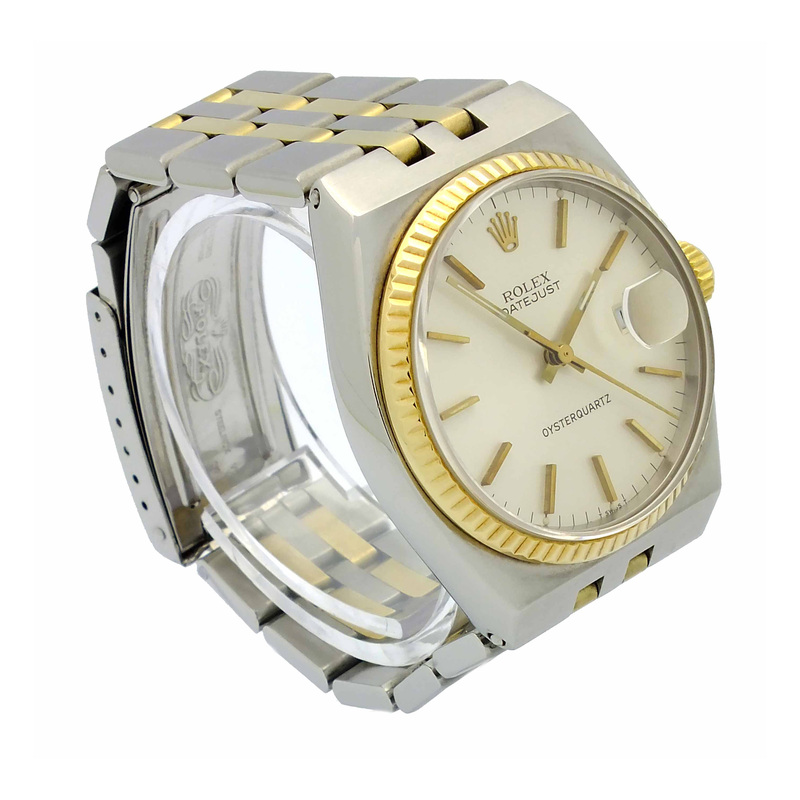 White dial with stick hour markers. 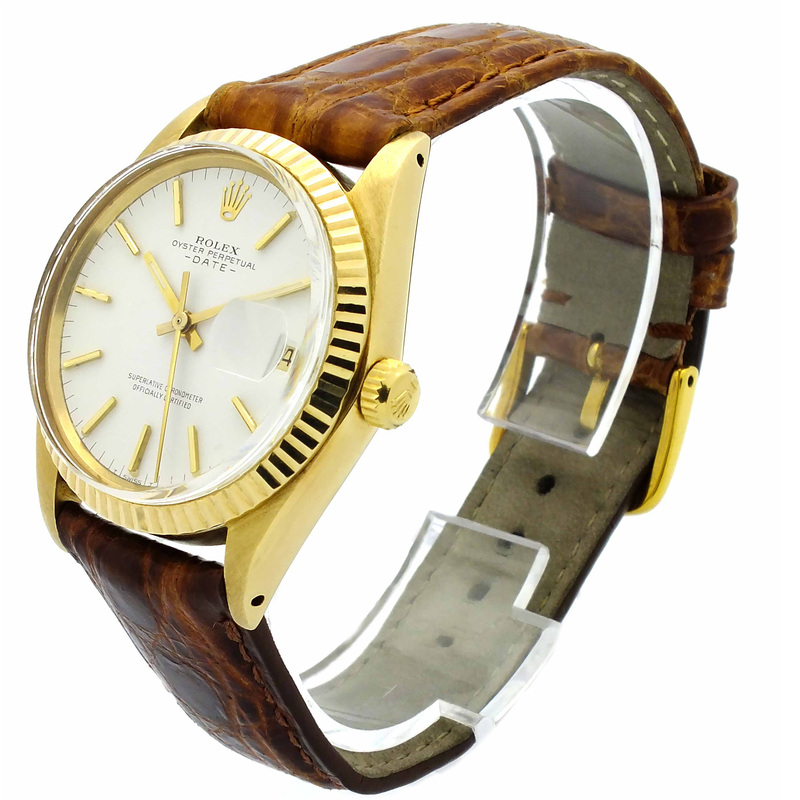 Rolex Oyster bracelet. 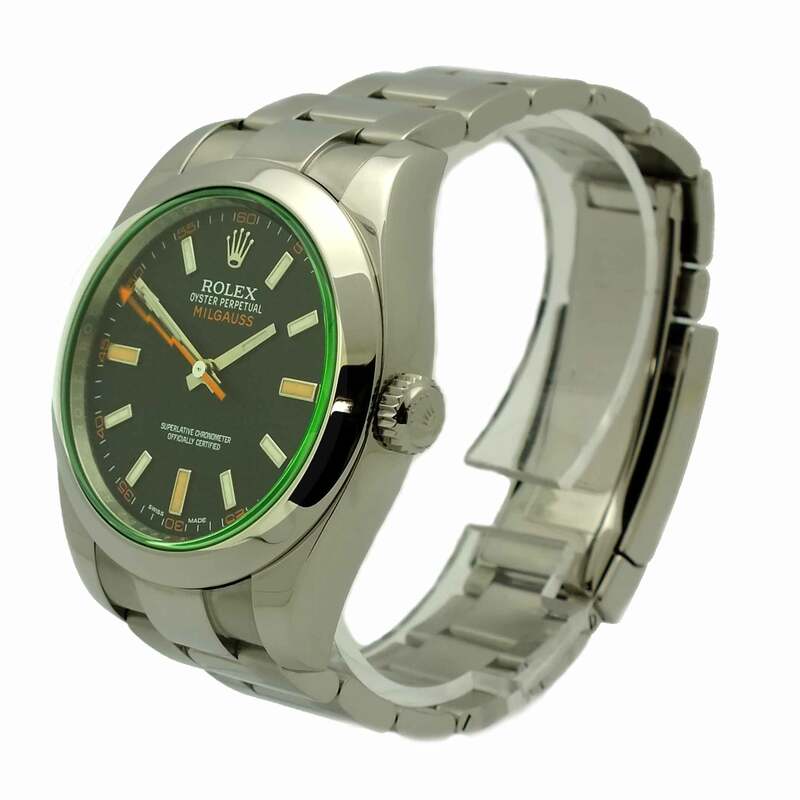 Rolex Milgauss in stainless steel. 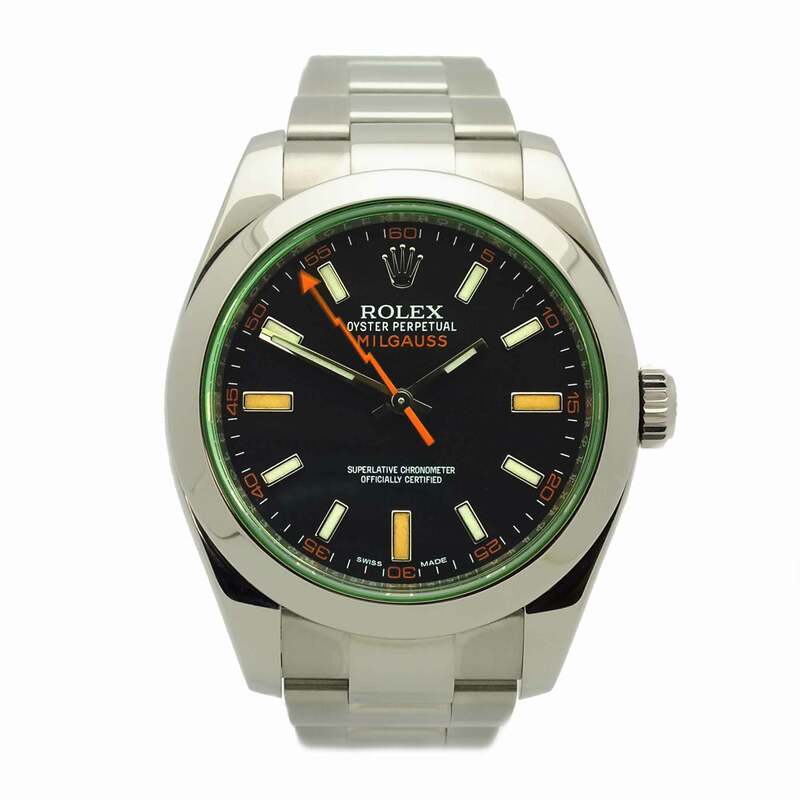 Black dial with white and orange index hour markers. 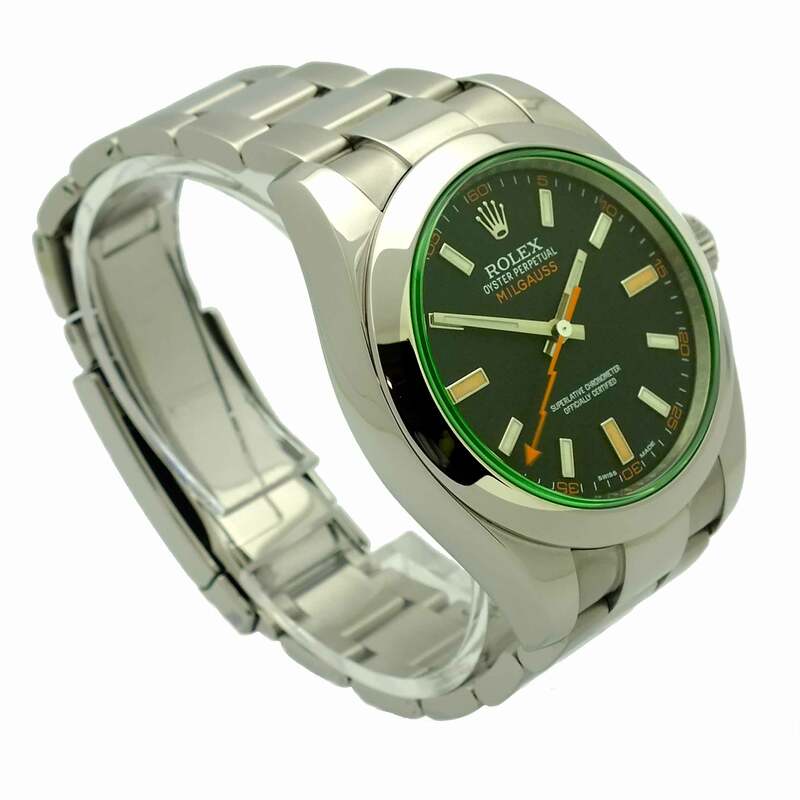 Scratch resistant green sapphire crystal. Orange lightning bolt second hand. 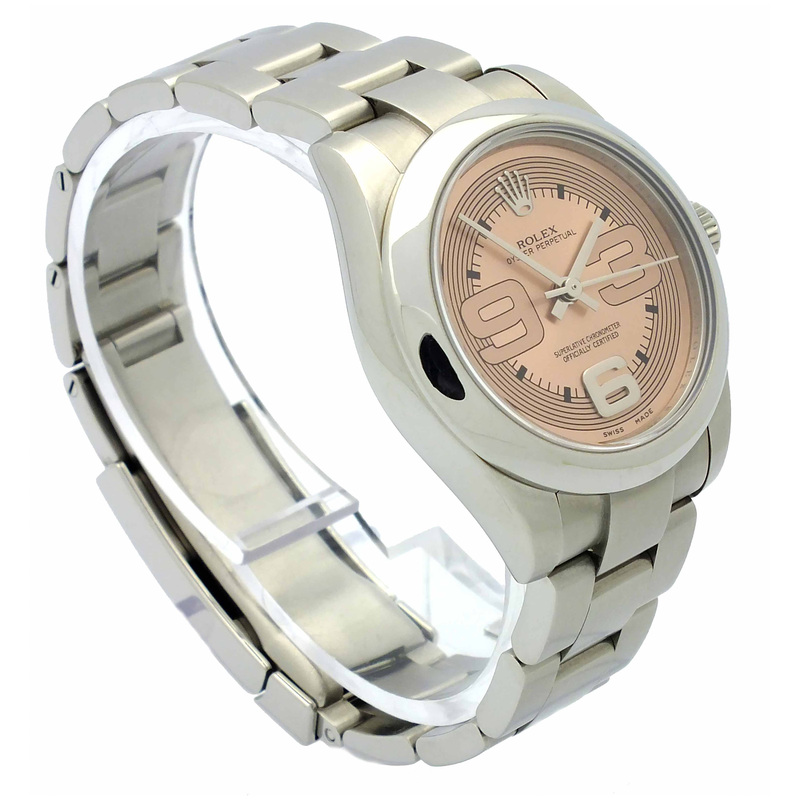 Stainless steel bracelet. 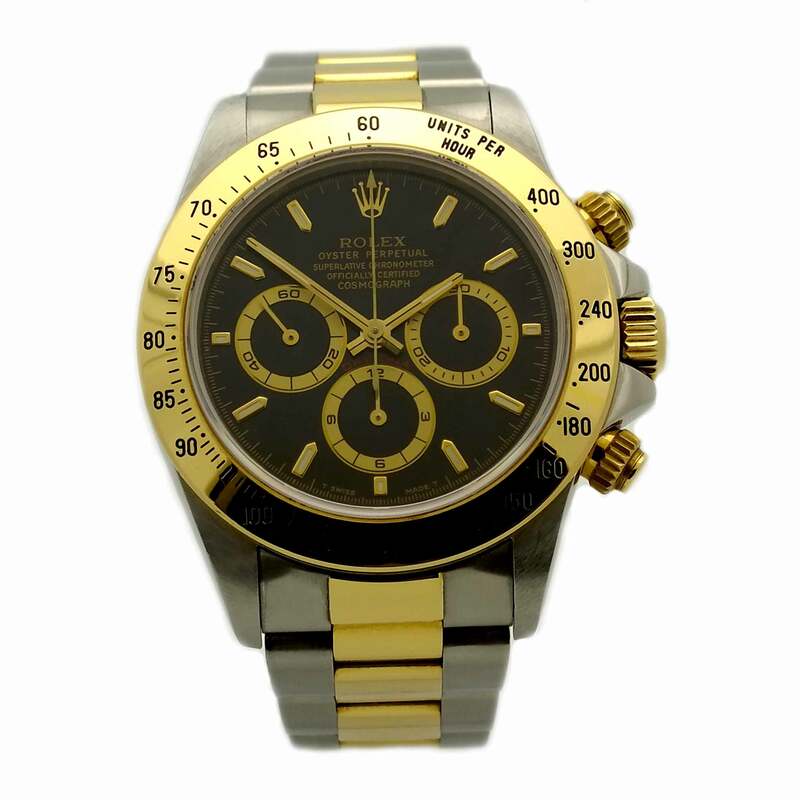 Rolex Daytona in stainless steel and 18kt yellow gold. 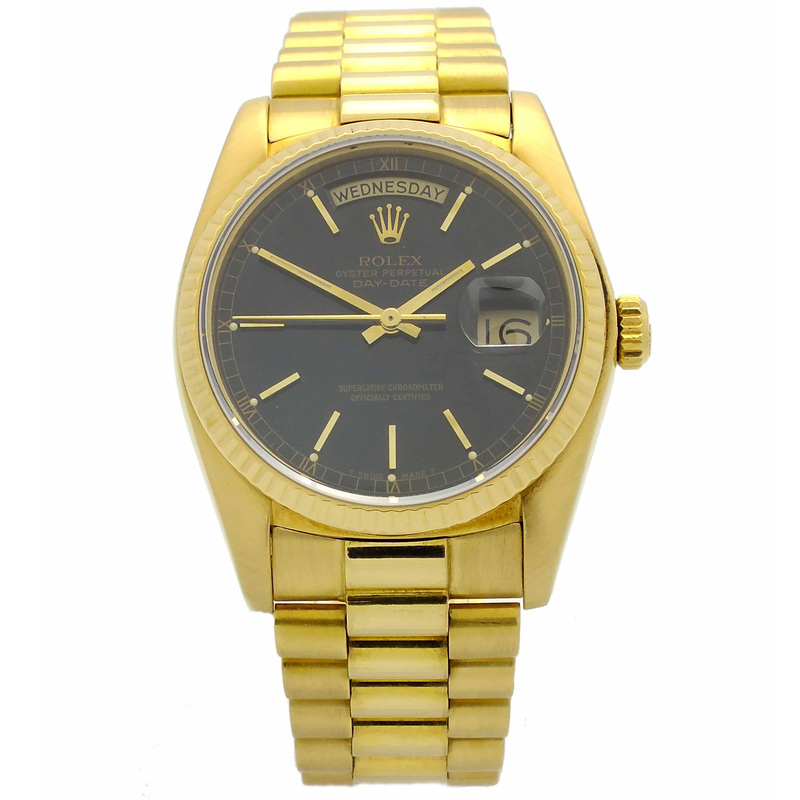 Black dial with yellow gold tone index hour markers. 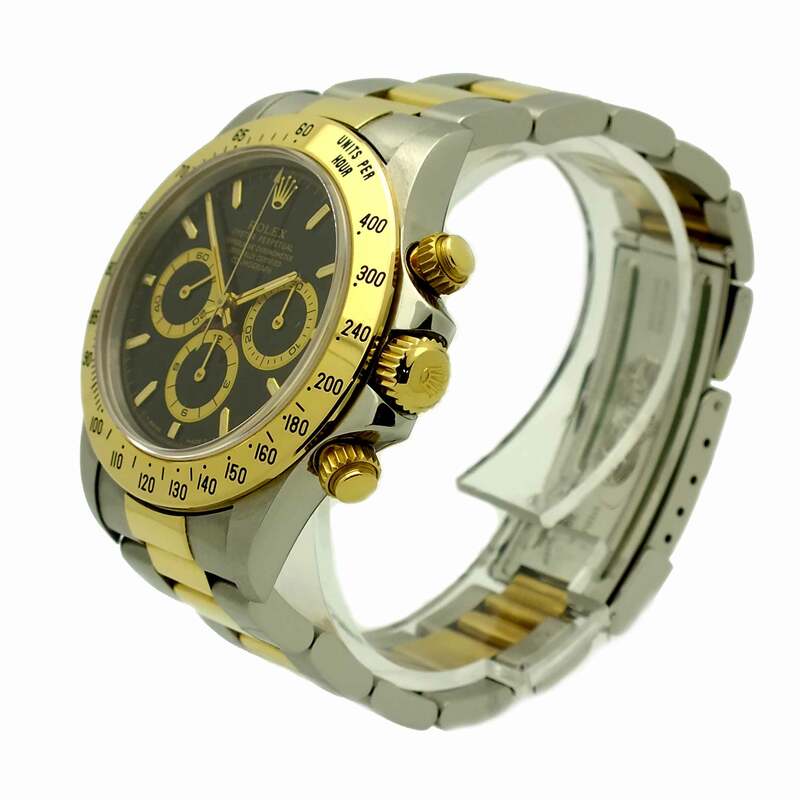 Rolex bracelet in 18kt yellow gold and stainless steel. 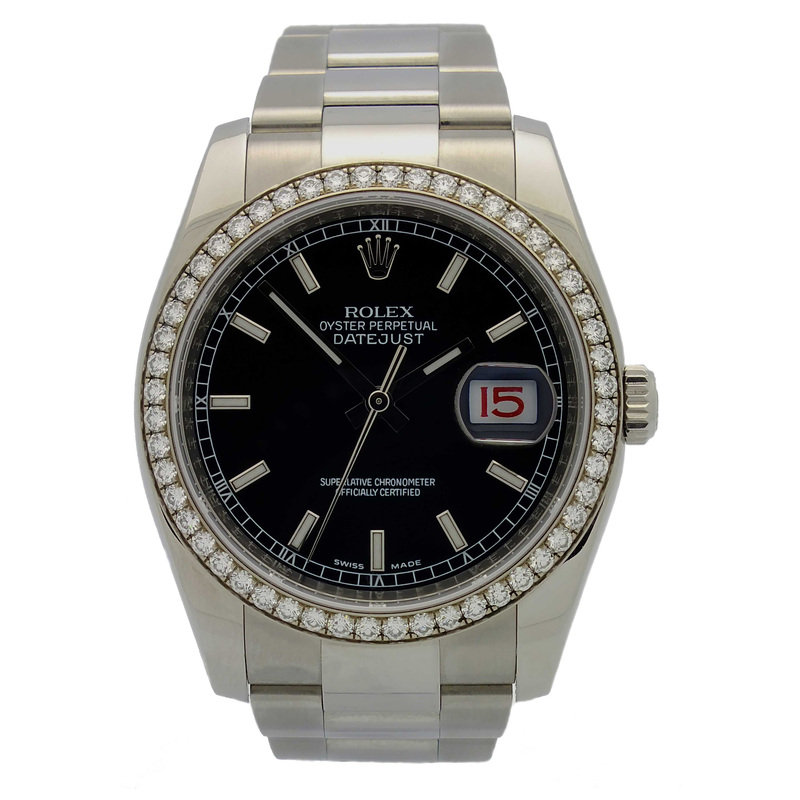 Rolex Oyster Perpetual Datejust in stainless steel. Fluted bezel in 18kt white gold. 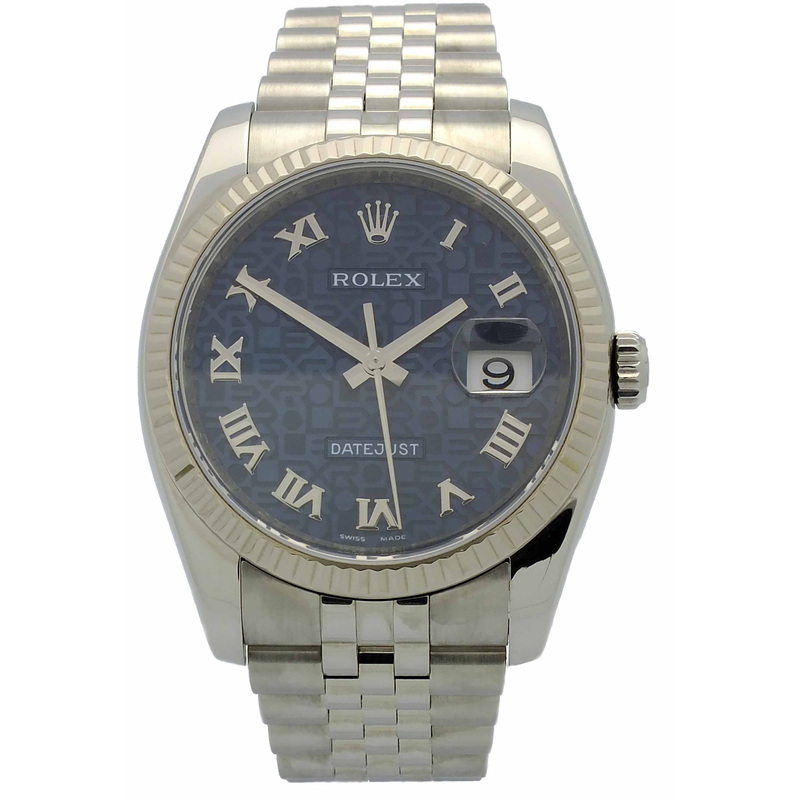 Blue Rolex Jubilee dial with silver tone Roman numerals hour markers. 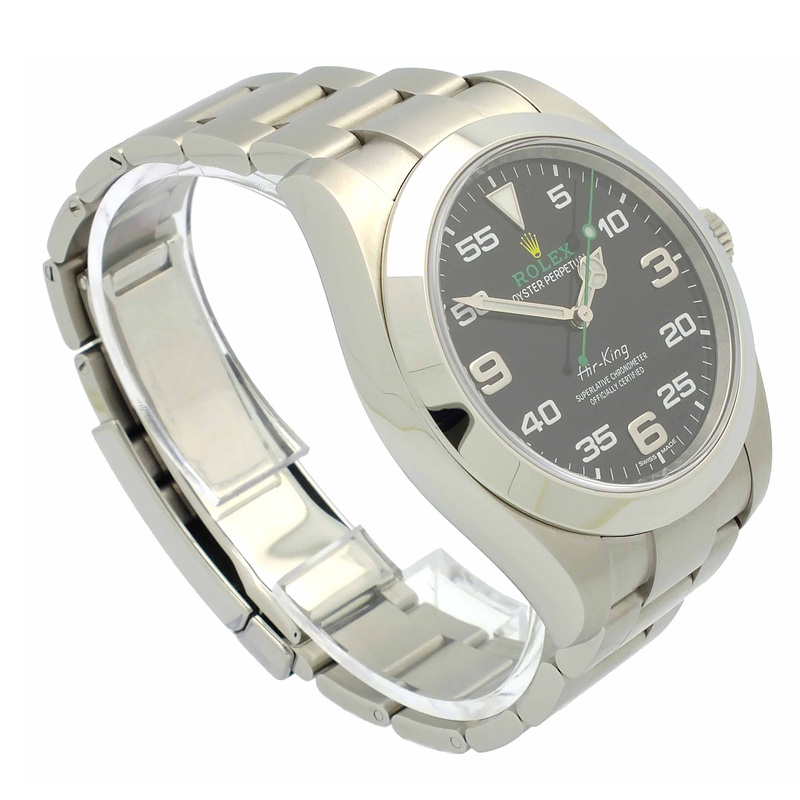 Rolex Oyster Perpetual AirKing in stainless steel. 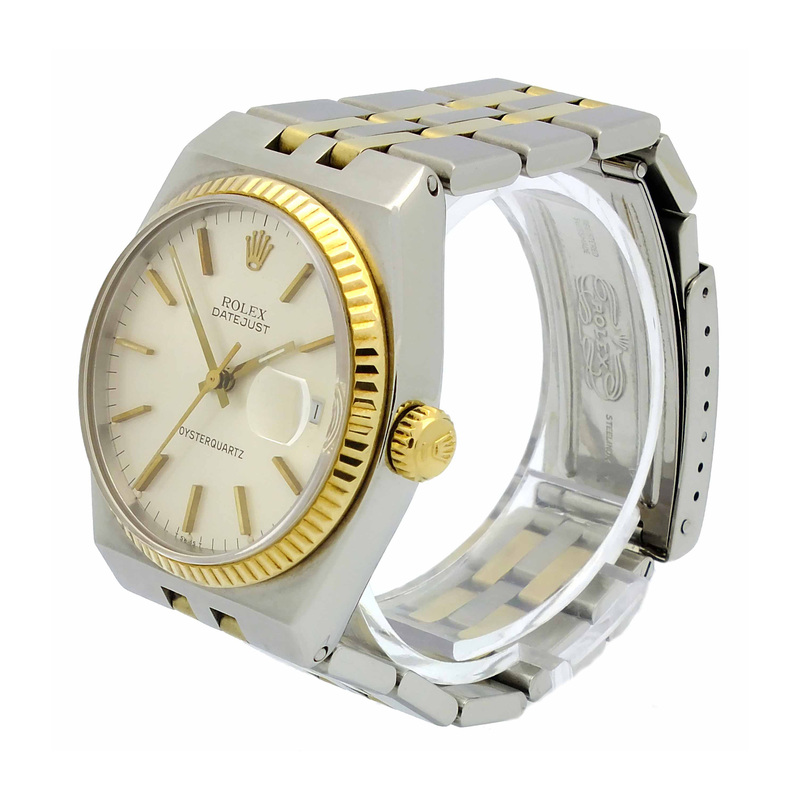 Smooth stainless steel bezel. 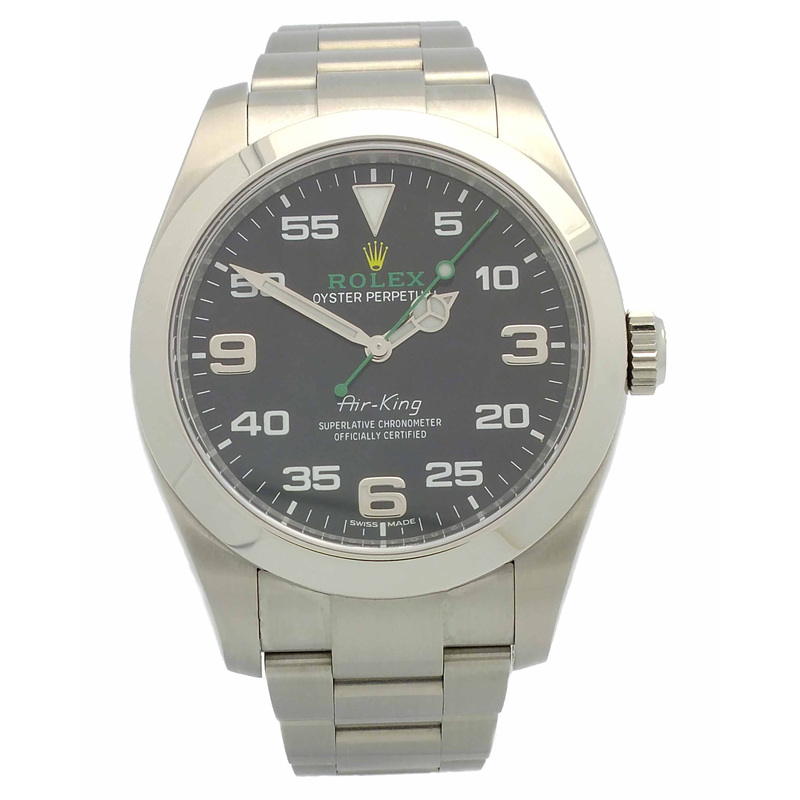 Black dial with Arabic numerals hour markers. 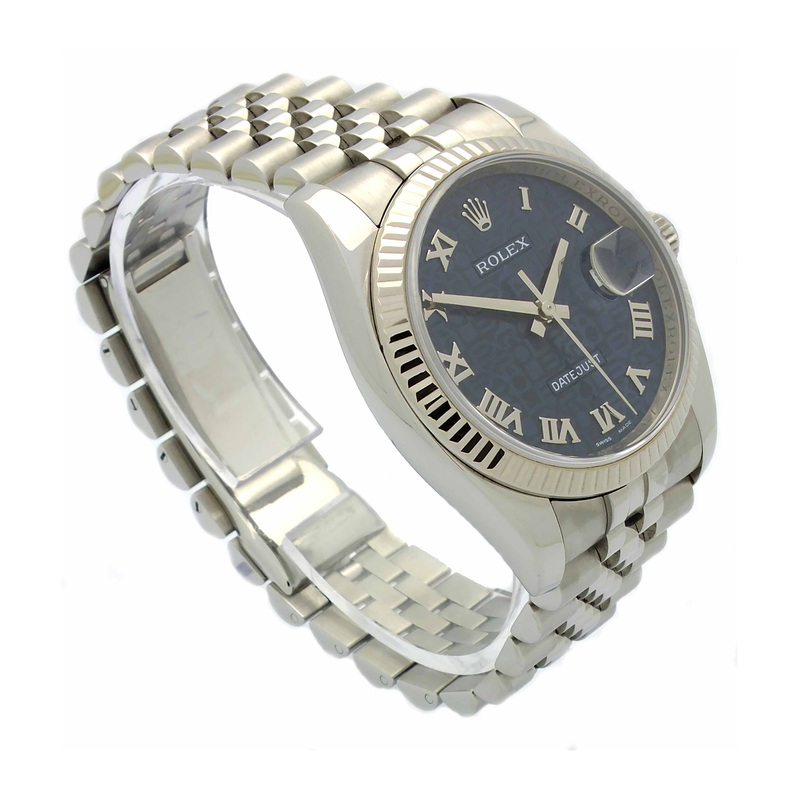 Stainless steel Rolex Jubilee bracelet. 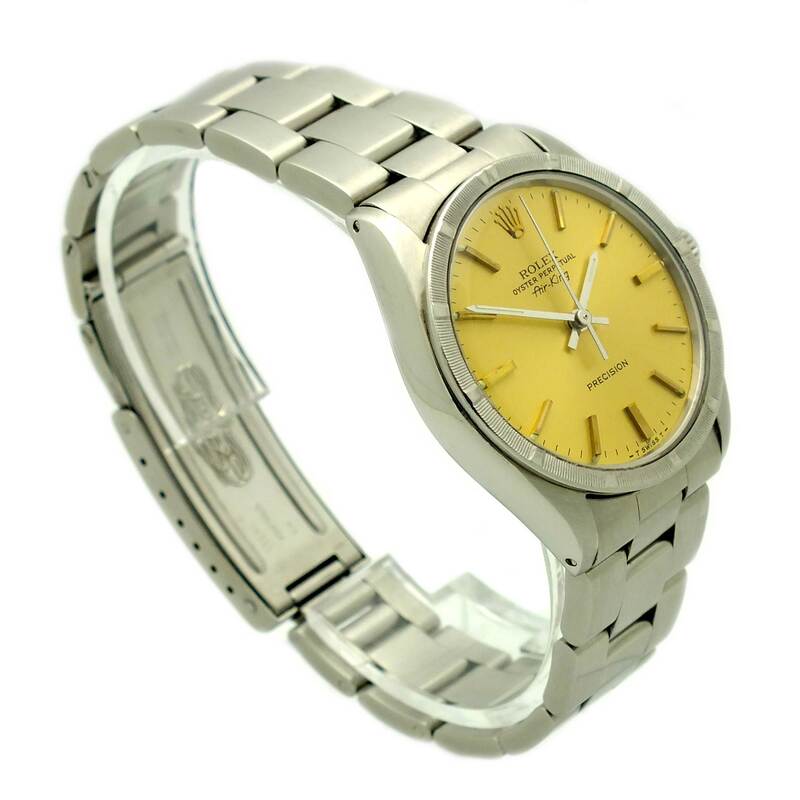 Vintage Rolex Oyster Perpetual Day-Date in 18kt yellow gold. 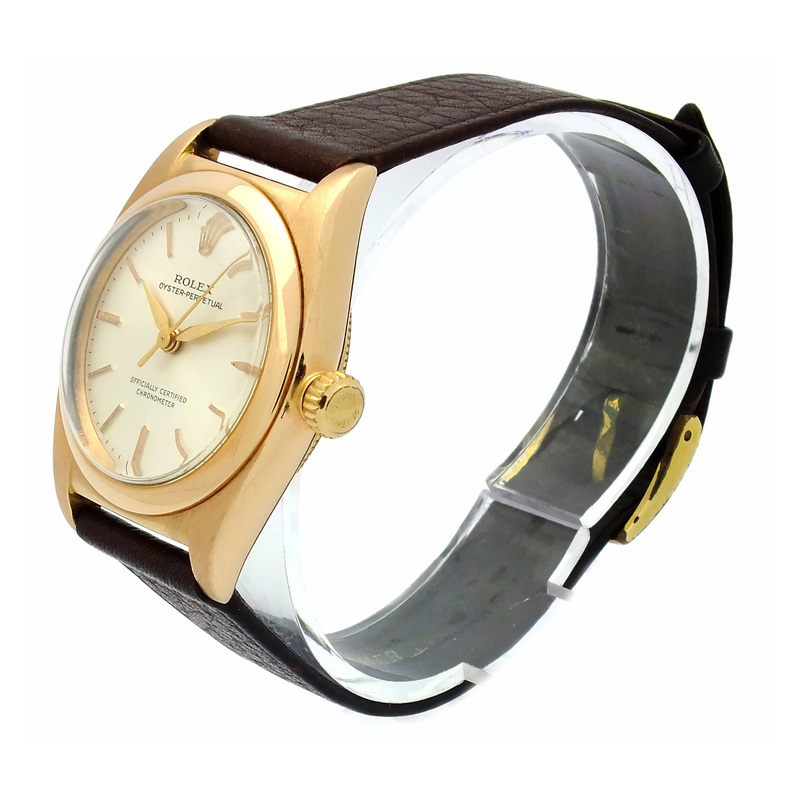 Fluted 18kt yellow gold bezel. 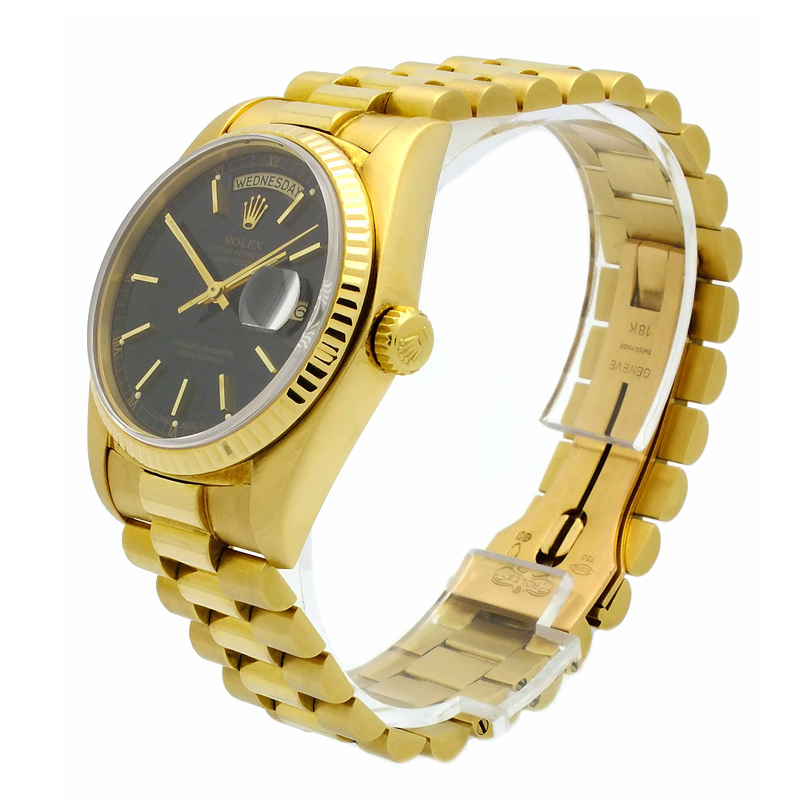 Black dial with gold tone stick hour markers.